Below are 12 fantastic gift ideas for a butterfly lover in your life or some ideas to pass along to someone trying to make you happy for the holidays. Over the next five Saturdays three new butterfly gifts will be posted, until I’ve revealed all twelve gift ideas on December 2nd. Before I started this annual butterfly gift ideas list four years ago, I had no idea how many wonderful butterfly-themed gifts existed. Based on research and recommendations, I strive to include unique ideas to help you find the perfect butterfly gift for someone special in your life. 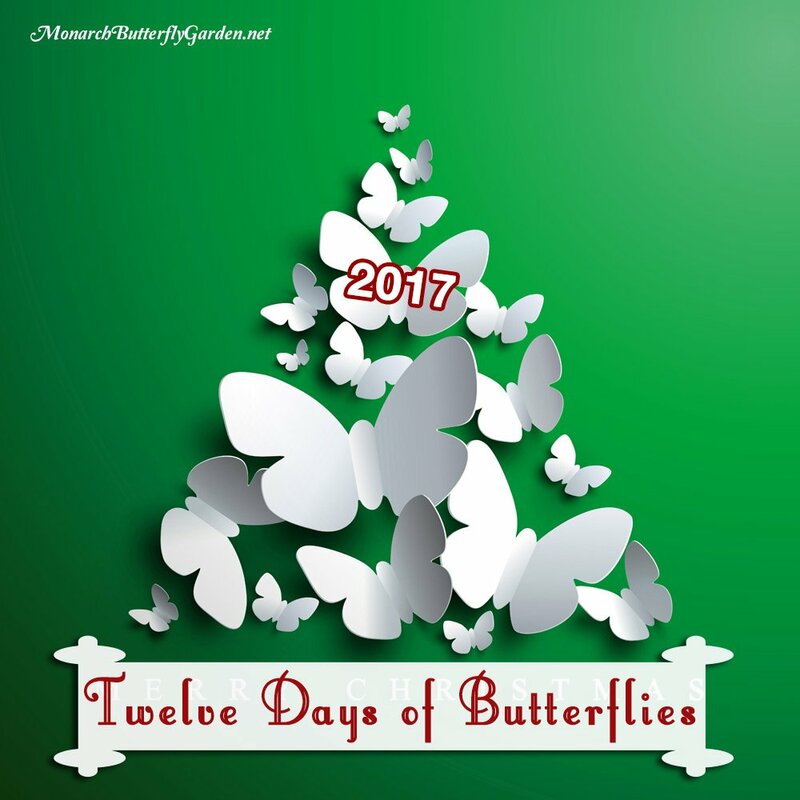 And now, without further ado…The 12 Days of Butterflies for 2017! A colorful reminder to all who pass by that your garden is a safe haven for butterflies and their pollinator friends. features butterfly favorites including monarch, swallowtails, red admiral, etc.. Forever Stamps to remind recipients the importance of protecting our pollinators, and spreading the word to others. Unique and stunning butterfly brooches with mixed metals and contrasting colors for a lightweight accessory you can wear all year long. A great way to spend an afternoon with friends, family, or even by yourself. Share monarch magic with the next generation of butterfly enthusiasts with a wonderfully written, beautifully photographed butterfly book that tells the story of Monarch Buddies Max and Maisy. With the deep decline of monarch population in the past decade, the monarchs truly need a raising hand, and raising butterflies indoors can increase their survival rate from 5% to over 90%. Fine mesh keeps baby caterpillars in, predators out. These butterfly cages provide additional height for those who want to raise butterflies on larger stem cuttings or milkweed plants. Why is milkweed a good butterfly gift idea? One of the best ways to give the gift of milkweed is by giving gift certificates to online sellers that have a wide range of vendors selling milkweed. This means the giftee will be able to find almost any type of milkweed they are looking for. Below are 3 fantastic online marketplaces to find milkweed seeds and also plants in the warmer months ahead…they also give the recipient the option to find other gift options if a garden isn’t in their immediate future. For years, eBay offered the best big marketplace to find a wide variety of milkweed seeds and plants. It still probably has the widest selection of milkweed available, but the competition is catching up fast. eBay sells everything under the sun, and a good gift certificate choice for the budget-conscious buyer. Amazon has many of the same milkweed sellers as eBay, and more seem to be migrating over. Like eBay, amazon sells everything and a gift certificate here is a great choice for those who value product reviews from other customers. If you know someone that wants to start a butterfly garden, this 6-pack is a collection of tried and true species that attract and support monarchs. These varieties can be grown across most of the US, but common and swamp will not thrive in continuous growing regions. Etsy is a place for selling home made products and crafts, and that includes seeds and plants. This marketplace wasn’t on my radar until recently, but there are a surprising (and growing) amount of milkweed species available here from reputable sellers and home gardeners. A fantastic gift certificate for those who value home made goods and crafts. Organza bags can be used to tie around seed pods to collect seeds outside, and they also make great gift bags for seed stocking stuffers. I love the tall cage. My cage mesh that I had made us starting with a couple holes. I like to cut larger cuttings of milkweed that I put in water bottles, so I like a taller cage. I also like the gift card. I may pass that along for a gift idea for myself so I can purchase supplies for next season! 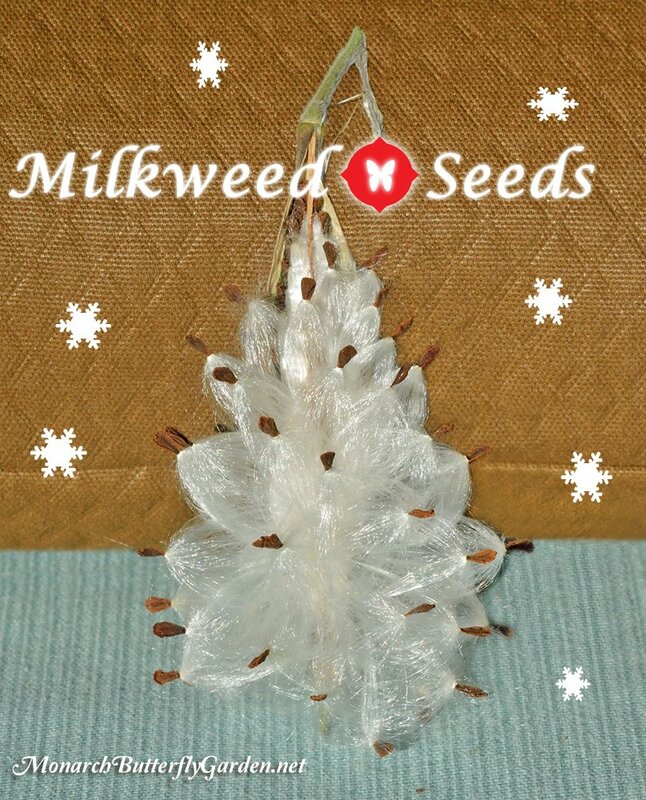 Of the gifts listed for days 7-12, I would love to receive #11, milkweed seeds! I moved to a new state this year, and I can’t find milkweed anywhere here, so I’m planning to plant my own milkweed for 2018, and I can sure use some seeds. Great gift idea! thanks for posting this contest! I would LOVE to give or receive milkweed seeds. Why? that is where the monarch’s life cycle begins! Growing it helps the process and I love watching it happen. I would love to win the big cube because it would be easier to raise our caterpillars next Spring. This year we used a tank covered with screen which was difficult to clean once they all decided to make their chrysalises on the top at once. For myself, I would like a new 24” high cage of either width so I can start trying raising the cats with potted plants. As a gift I would choose the seed packet assortment and give it to the teachers at the school I recently retired from. They have discussed starting Butterfly gardens and this would help them get started. I would so love to give the gift of the milkweed seeds to my 6 year old great niece, Aubrey as I got her very interested in the Monarchs this past summer and she is so excited for next year. She will then be able to plant the seeds and continue to help them on their journey and tell others what she has done. For me, the best gift would be number 11. A gift of milkweed seeds would be a gift for everyone else I come into contact with as I love to share seeds with all who are interested. I would like winning the milkweed seed prize (11) if my comment is a winner in the comment contest. As a member of one the American Indian tribes who are working hard to help enlarge the Monarch populations that migrate through our tribal lands. As a part of my effort, I have started a Monarch garden. The seeds would be used to get my garden well established. I would like to give AND receive milkweed seeds! I had great success attracting butterflies to my yard this year by following Tony’s recommendations for the best nectar and host plants! I have had Asclepias Tuberosa and common milkweed for years. The monarchs really liked the addition of the Swamp and Tropical milkweed I added this year. Next year I hope to add Purple milkweed and maybe even find some Redring! Wow I don’t think I can decide. Over the past week we’ve had 7 monarchs emerge from their chrysalis. We should have 2 more come out tomorrow. There just aren’t words to explain the joy this brought us. So I’m thinking the gift card would be a great gift to give. Maybe help introduce one of my friends to the joy of monarchs. I want to thank you for all I have learned here. May the great bless you and yours always. IT is impossible to narrow it down to one! I raised my first 2 Monarchs and currently have 2 Swallowtails and 1 Wooly Worm in the garage, so I’d of course love another cube! The tray for floral picks is genius. I stuck mine in egg cartons but they sometimes fell over. And the book! Definitely buying for my grandkids! And seeds…awesome! Can’t wait for next year!!! I would like to win the day #8 butterfly tall cage. I like that it is white to see in and that it zips down. that I can let them grow on inside the cage. I managed to get 80 raised before my surgery this year. I would love to receive the tall Butterfly cage! It would allow me to increase the amount of cats I can raise at one time. I would love to give the milkweed seeds cards as gifts. That way more people will plant the life line of these butterflies! I would like the Milkweed seed collection. I used to have a lot of Milkweed on our property but we had a bad winter 2 years ago and a lot of them did not return. My favorite to top my list is the butterfly crossing sign. What a neat sign to show up in the neighborhood where I live across the street from a city park! Followed by the tote bag so when others comment on it everywhere I go I can tell them about my quest. Many people know I raise monarchs, but the sign would tell others how much they mean to me. It might also encourage them to try to help the butterfly’s recovery too. Then either sized cage would help them on their journey…….. I would love to use the pollinator forever stamps to mail my Christmas cards to remind all my friends and family to protect our pollinators, but after several attempts, I have given up. The site is unavailable and when I tried the usps website, they do not offer these beautiful polllinators forever stamps! If I can purchase these, I will use them. If not, maybe next year. Merry Christmas! I love all of these ideas! I think my initial pick would be the milkweed seeds so I could plant a variety all around my yard and have seeds left over to share with friends. I’m on a mission to get more people to plant milkweed. Sorry, I do not have a favorite! You have done a magnificent job on your selection. I am certain, any of my friends, that I helped get involved in the raising of butterflies, would be thrilled to have any or all of your gifts. I am currently starting 5 pots of purple and white butterfly bushes to give away to friends. I must say that If I do not receive your variety pack of seeds (the gift that keeps on giving)by Christmas, I will be ordering them for myself. Thanks again for sharing your interest! Merry Christmas to each and everyone of you! Tony, Thank you for all the advice during the year! I would love the tube and pick holder. Right now I use a pot of soil, jars, or an old floral cube. it’s hard to move them, replace the milkweed, and water them. Milkweed seeds please! I work in a botanical garden and our butterfly house was the first and is one of only two native houses in our state. Without milkweed we would have no Monarchs. It is vital to keep milkweed planted for their continued survival. I speak to elementary classes on the importance of our pollinators and preserving their habitats. I share with the teachers milkweed seeds to plant in their school gardens. It has been a huge success. The kids are turned on to the plight of our pollinators and have a strong desire to conserve the precious resources we have, including the establishment of a Milkweed oasis they create with their own seeds. I’m known as Miss Maggie Milkweed by the kids. I’ll proudly accept that title and live up to the name. I would love the Monarch Cube or the Tall Monarch cage. I just started planting milkweed last year and am ready for the next step. I have several friends that raise them and they are teaching me what to do. I look forward to this season. I would like the butterfly crossing sign.I have several of your cages and really like them. Now I have started a garden,tis sign is colorful and would look nice with a few Monarch flying by. I know others who have gardens would like it for the same reason. Merry Christmas everyone . I would like the butterfly sign for myself and I know friends who would like it too.It’s colorful and cute for my new Monarch garden. Merry Christmas everyone! All wonderful ideas, but I like #8 the most. After getting through my first season of raising cats, this enclosure would be a fantastic addition for next year. With its zipper side and overall size, cleaning and getting to cats and butterflies would be easier and safer than what I’m using now. I love the new size of the baby cube and the drawbridge door. Definitely a must have for any monarch raiser. The milkweed seed cards are great also. I like to have a variety of milkweed growing in my yard and that is a great way to spread the word about growing milkweed for the monarchs. Plant milkweed and they will come! 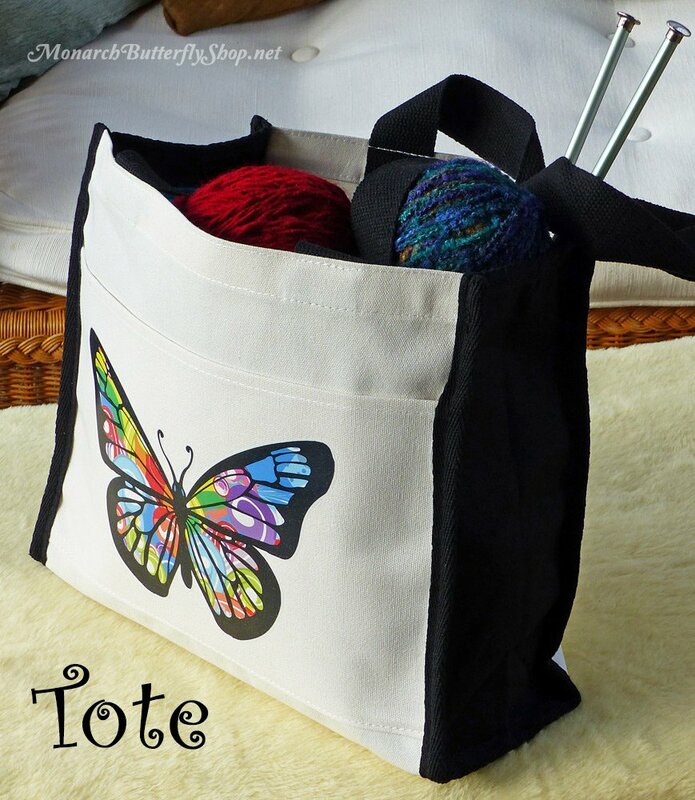 Love the tote bag too and would be great for shopping to use as a grocery bag or to hold butterfly raising supplies which is what my intended use would be. Looking forward to another great season of monarch raising in 2018. I would like to receive the Butterfly Cube Cage #7. Its fold down, side entry door makes it so much easier to access the caterpillars and the milkweed they are chomping on! I am hoping to raise quite a few more Monarchs than last year! I absolutely love the tall cages that I can put my outdoor potted Milkweed into and keep outdoors. As of today I have (6) outdoor potted Milkweed Plants with Many Eggs and all Stages of Caterpillars. I have (3) Cats that left Milkweed today and have traveled to my Ficus Tree and Geranium Plants to prepare to go into J Formation. Thanks Tony for all your advice. 3rd year of raising monarchs. Since I now have both sets of grandchildren and a son in law raising now, I have ordered some of these items for Christmas presents. My favorite is the big cage. It will certainly help to increase the amount to release. My favourite gift to receive and give is the butterfly cage. It seems like a perfect solution to raise caterpillars along with the little tubes for holding clippings!! The larger butterfly house is the way to go if you raise several Monarchs. Definitely on my Christmas list! I like the milkweedseedd. Would like to have the variety. I also love thedrawbrige door on the habitat. Much easier to get in fhere. I would really use the tall cage, #8 because I like to use large cuttings from my milkweed, because I have so many. I would love gift card to order plants for our new outdoor learnig center center at my school. I would enjoy getting gift cards to give to friends who show an interest in my hobby of growing milkweed and nectar plants for butterflies. I especially enjoy protecting cats and seeing them through their metamorphis to adult butterflies and want to encourage others to do the same. I would like # 10, the tote bag. It’s colorful and provides opportunities for educational outreach. I would like to give the #11, the Milkweed cards. It has several good options, especially for schools to plant in their Butterfly garden. So hard to make a decision with so many unique items listed. However, if I were to give or receive one of the items I think it would be the 11c choice of an Etsy Gift Card for Milkweed Seed and Plants. The reason is due to the fact that one can never have enough milkweed plants and blooms for they are an amazing genus and their flowers intrigue me. If chosen I would like to receive the Asclepias purpurascens seed as it is so hard to find . How can you go wrong with a gift card? I would LOVE to receive one, and may also purchase a few for beginning butterfliers. Great idea, Tony. I think that the tall cube would be a perfect gift. I have been sharing seeds and milkweed plants with a local Nature Center in a state park. 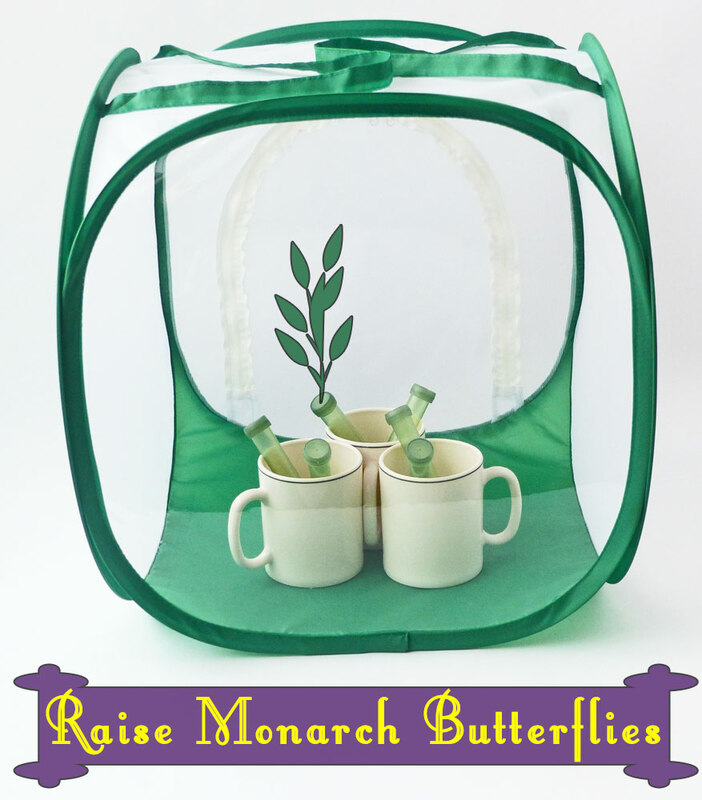 They are ready to inspire others to protect the Monarchs by raising them indoors. Thanks for all you do to help us be better stewards for the Monarch. I like the tall butterfly cage, it would be a great gift to give or receive. It would be interesting to raise monarchs in next year. I love giving and receiving Milkweed seeds! My friends know how much I love Monarchs and would know this gift comes from my heart! Please Please Please. Any size butterfly cube will be appreciated to help me with my Monarch classes at our local high school. Love the site and look forward to each posting. We raised one monarch last year and around 10 so far this year with our old cage. Making the jump to larger numbers has made me realize the importance of a side drawbridge. What a great idea! I’ve had problems with chrysalis hanging by the zipper and eventually getting knocked down. Luckily they still made it after taping them back up. I’ve got tons of milkweed and and sharing seeds with fellow gardeners. Hoping to raise even more with my young kids next year. Their pre-K classes love to see the butterflies and caterpillars grow. Growing more monarch lovers every day!! I would love to receive (and give!) a baby cube. I started with one baby cube then ordered another to accommodate my growing passion for raising monarchs and black swallowtails. It is easy to clean and well-made – much better than the look-alikes on the internet. You can see clearly through the plastic viewing panel. Perfect for anyone who is curious and just starting out! I would LOVE to give away the milkweed seeds I harvested this year in the gauze bags. Such a cute idea! I also plan on using the gift cards for different types of milkweed. Would enjoy the gift of the tall cage to continue educating my 2 and halfhear old granddaughter my neighbors and myself. This will be the third year we are really envolved in helping save the monarch butterflies. We have some milkweed plants we are sharing with friends neighbors etc would like more variety for the southern Wisconsin area. This is becoming a great hobby and conversation with many of our community. We are here to spread the message to save the monarch butterfly. Definitely the milkweed seeds!! Awesome gift idea!! I would love to have the tall cart butterfly cage. Really, I would like to have anything connected with Monarch butterflies. I’m planting as much milkweed as I can! Day 7’s Butterfly Cube for raising monarchs would be a great gift for me or for my other butterfly-raising friends. When butterflies first eclose, they need a place where there is room for them to expand their wings and flutter around, but where they also are protected from pets and other potential hazards. These cubes are wonderful for that purpose, and are also great to use to transport butterflies, like for an educational outreach event.
. These are all great gifts. I would love any of the cages. I already have a small, a medium and a large. We released 44 monarchs last fall and next April we start again. We have planted more milkweed and hope to have many more butterflies. This last time we brought in the eggs and that ballooned the population of caterpillars. I think I would choose the seeds and another large cage – maybe the tall cage so we could try using the tube holders. Thanks for all you do to encourage us as we attempt to bring these lovely creatures into the world. PS: I also love the tote bag. I would give the butterfly tote to my spouse, who doesn’t garden, as a thank you for listening to me about monarchs and also for finding me a used china hutch which I transformed into a butterfly cage. The Butterfly Natural Tote Bag would be my choice of a gift. It would be a great conversation starter. It would give me a great opportunity to talk about Monarchs. I liked all of the 12 days! what a fun idea. My favorite would be # 8 +#9 I had a rough time last season (my first) with little bugs on my milkweed leaves , supplying water successfully and getting my dear ones to the butterfly stage. It seems they had a disease. I used a large plastic “bug collector” cage , collected 8 caterpillars and was so glad to be able to watch the action. I was so excited to get one butterfly but it died outside on the flower I placed it on. This was all sad to me but I want to really try again next year. I have collected loads of seeds from my local milkweed patch! Planted some last fall and will grow to seedling and put out more in the spring. this I am good at. My choice would be the day 8 new tall cages!!! I just purchased one of the 15x15x24high units and would love to have the 24x24x36high unit. My reason for the second and taller wider cage is it would increase my ability to raise more Monarchs. I would love to receive or give the milkweed seeds (number 11). In fact, I just sent an E-mail to my daughter to tell her if she needs another Christmas present for me to please buy the assorted milkweed seeds. I just started a butterfly garden in my backyard and have started to attract a few Monarch butterflies, I am hoping to attract many more with more milkweed plants. I would love to receive and give the milkweed seed assortment. Everyone should grow more milkweed! The more variety, the more choices mama monarch will have. Thanks for all your raising tips Tony! I had an awesome year raising. The cubes worked great! What beautiful choices. I have been in the Master Gardeners classes for the past 12 weeks and am inspired to plant a butterfly garden. My choice would be Kaylee Baumle’s “Monarch Butterfly Book and the free milkweed seeds to help me get started (11c). By next year I hope to have enough info to need some cages in which to raise the butterflies. 11a would be the perfect gift for someone like me just getting started. I purchased 300 seeds in the last two weeks off of eBay already!! I would like to receive the tall cage to add to the two I have. I raised 100 monarchs last fall and hope to raise many more next year. I figured out some things that made it more efficient, and more cubes are definitely needed! I vote for the Milkweed seed collection, because no matter where you live, you can grow the food that Monarchs must have to live. I would like to recieve Gift 7 — the butterfly cube. It would be a good gift to receive to put next year’s caterpillars in. I bought one this year and raised 134 Monarchs! My cube had about 75 chrysalides on the roof at one point. I need another cube to give them a little more room. Great gift ideas. I would love to have/give #9. The cuttings holder. I’ve laid cuttings on the bottom of my enclosure, but haven’t been happy with that situation. I’ve come up with creative ideas, but they haven’t been as simple as this. My daughter uses egg cartons, she’d like this too, I may just have to buy a couple of them for me and for her. I would give the gift card because you never can guess what you will need . So you know I would love to get a gift card because I never have enough supplies to host my little caterpillars. I would like to receive #8, the tall butterfly cage. I grew tall milkweed plants last year and will be raising my first bunch of cats from eggs this coming spring. I’d need the tallest cage to place my plants in. The cages are very sturdy looking and would be good for my indoor nursery. The gifts this year are amazing, thank you. I would love the seeds! I am taking a master gardener course this winter to increase my gardening knowledge and be able to share with others how to plant butterfly friendly gardens. I would love to give gift #9 because it would allow any milkweed leaf cuttings to stay fresh, therefore making leaves more appetizing to caterpillars. Floral tubes are a must have! I am overwhelmed with the gifts you have chosen this year. What would I give? So many! But I am going to choose one for myself and pick the Day #10. The tote. I use lots of totes in my volunteer committees. This would be perfect for me. I will put that on my list for Santa! I would like to receive the tall cage. I just started my journey with raising butterflies last summer. I made my first cage and then bought 2. I found out I need more cages for next year! Thanks for what you do, keep the information coming. I love all of the gifts you have. I think #12 would be a wonderful gift. 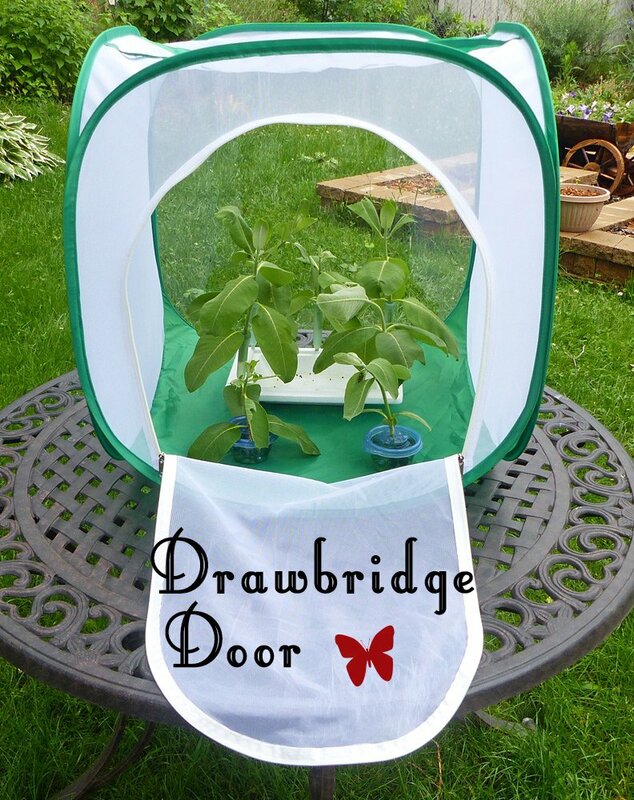 This would be nice for someone just starting out with raising butterflies. I know several friends that are very impressed with my butterfly garden. It would be a great start for one of them. I would love to receive and give Day 11, different milkweeds. That would allow me to have a gift that keeps giving! I would most like to receive 11c., an Etsy gift certificate. Author Kylee Baumle’s book is something I would treasure, plus I’d get free milkweed seeds! I think the book would be a great resource for me to share with those who are new to the whole idea of raising Monarchs. Me encantaria recibir Day 8- Butterfly TALL Cages for Raising Monarchs . En Argentina no encuentro un lugar para comprarla y realmente me seria muy util,muchas gracias!! My choice would be the butterfly tower cage so I could have an actual plant in there with the caterpillars, and change it out for a new one when they have devoured it . I went crazy this year replacing clippings in flower tubes. WOW! What a selection of gifts! I would love to give AND receive the large butterfly cage! It makes life so much easier raising monarchs! I love it! I would like a butterfly cube because it would be much easier to contain and raise our caterpillars, while being able to keep it clean. This year we used a fish tank covered with a piece of screen. It worked well until all of them decided that one corner if the tank was the perfect place to make their chrysalis. I would love to receive Day 11’s gift idea. A variety pack of seeds is ideal so that the incidence of disease with just have one variety of milkweed is diminished and would have some color variations in the garden. Plus, you’d have enough to plant in different areas to also help cut down the incidence of predators, etc. I would love a tall baby butterfly cage! I’m starting a butterfly garden and plan to raise monarchs indoors. I need a cage to put the cats in so they can’t fall off the table from wandering away. I would like to receive number eight, the tall cage. This would be great for teachers at out school to raise butterflies in the classroom. Any gift from 7-12 would be welcomed by me. As for a gift the zippered protective ‘cage’. I think it was number 7. A new monarch person would have a great start with this gift. Day 8 – I would love to be able to have the option of using plants in addition to cuttings and the height would be perfect! I love butterflies and think all the gifts are great, but since I need to pick I believe it would be the seeds since I am having difficulty finding them. I started an area to prepare for the butterflies. I am fascinated watching them so cool. The Twelve Days of Butterflies- Butterfly Gift Ideas 2017 list has so many great gift ideas making it hard to choose! However, I would love to receive the tall butterfly cage or #11 gift cards of milkweed seed. The tall cage would be terrific for longer milkweed cuttings or plants giving the hungry caterpillars an ample supply of milkweed to eat! Having a variety of milkweed seeds to plant would be fun to grow. Thanks Tony for all the wonderful information you share throughout the year! I must have those stamps for my holiday greetings! I would LOVE to receive the gift of milkweed seeds so that I could provide a greater variety of milkweed to the Monarchs, instead of having only two varieties. I would love to get the tall butterfly cage as i had limited funds after buying plants last spring and had to DIY my rearing cage. It worked but a cage like that would be a HUGE improvement and less of a hassle ot clean then what i had set up. Of all the gifts, I would like the day 8 prize the best, the tall butterfly cage. This year was my first for raising monarchs. I did not have a cage and used branches and netting to create an enclosure. I found and raised 12 monarchs over a 2 month period. I have a cousin who, using 2 of your cages, raised over 100 monarchs and black swallowtails, releasing them back into the wild. I would love to receive either butterfly cage to help me with raising Swallowtails, painted ladies and monarchs. I’d like to receive the butterfly forever stamps and the largest cage. I love the idea of giving a book of Monarch Butterflies Plus you get milkweed seeds.. What a perfect gift as a starter to give someone that will no doubt get hooked on watching the process. Seeds, please! For myself – Every year i enlarge my Milkweed patch and like to add new varieties. Or, for my gardening friends who also garden for Monarchs. My choice of gift, both for myself and others, would be #11, the gift cards of milkweed seed. I have a lot of common milkweed growing but this is the first year I have brought caterpillars inside and had the thrill of setting the beautiful butterflies free outside. I would love to have a greater variety of milkweed plants and my enthusiasm has made others I know want to raise Monarchs, too. Hi Tony. All of your gift ideas are great! My favorites to give or receive would be the seed starter packs and the tall butterfly cages. More seeds would create more plants, more plants would attract more butterflies, and larger cages would mean more room to protect them! Happy holidays! I’d like to have the day 8 tall cage as a gift to me cuz I like the idea of putting actual plants in the cage. I would give day 12 butterfly gift card so the recipient could pick anything they want. Wow! what a selection of gifts! My favorite to receive would be the Monarch Tower cage. 2017 was my first year raising monarchs and I had some pretty good ideas from friends about containers for raising caterpillars, but all of the ideas involved plastic. I would love to upgrade more “monarch cages” to a mesh cage with this item. That would be like an upgrade from a 2 Start to a 5 Star hotel!! I used a sun room for my growing area and it attracted the attention of many friends and family. I am trying to inspire others to raise caterpillars. I thing the Tower would make it easier to display the monarch life cycle to interested potential butterfly growers in my social circle! Another tough decision as they are all awesome gift ideas! I would love to give or receive the Butterfly Tote Bag. It’s pretty and functional and might even be a good conversation starter about butterflies. I have to say that I also love the milk weed seed collection. Such beautiful colors! I need to branch out and plant some other types of milk weed! I’d I’ve to win Day 8, Tall Butterfly Cube, for contest 2, because my milkweed growing in pots would need the added height. Thanks for the fun contests & chance to win awesome prizes! 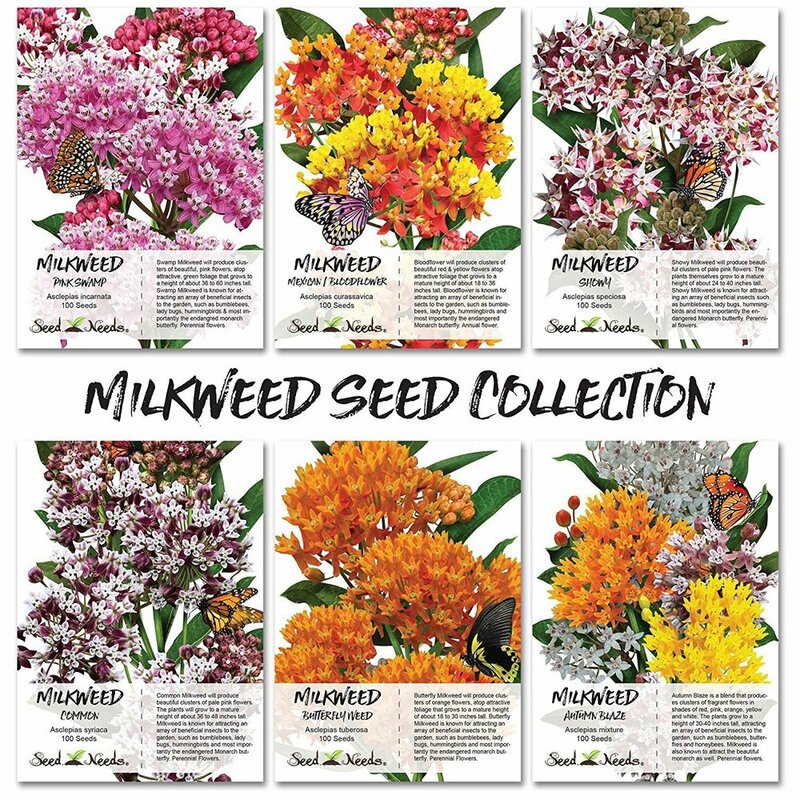 Of butterfly gift ideas 7 through 12, I would love to receive Day 11: Give the Gift (Cards) of Milkweed – MILKWEED SEED COLLECTION!!!! I am giddy over with this offering! Over 600 seeds to plant and attract Monarchs into my garden! I am a novice at raising butterflies and have had a little success with black swallowtails, and though I have seen monarchs around my five milkweed plants this summer, I have yet to find an egg OR caterpillar. If I received these seeds, I would share some of these with a couple of my friends who raise and release Monarch Butterflies, and continue seeking their advice and wisdom about raising/releasing them myself. Of the Days 7-12 gift ideas I would like the Butterfly cube. My granddaughters have moved to a new home and want to start a butterfly garden . I have already given them the seeds to start their milkweed patch and will take them more plants in the spring. The cube would be perfect for them to start off their first season of raising Monarchs. I love all the new cages! I would like to receive/give Day 8 Tall Cage. I especially like it because you can put a potted milkweed plant in it so you don’t have to keep providing leaves for the babies every few hours. Plenty of room! I would give my daughter the monarch tower. That way she could raise butterflies to match the wings she wears all the time. I would like the smaller butterfly cage, I need some small ones to use to quarantine cats that look ill. I like the milkweed seeds. I live in Minnesota and only knew of the Common Milkweed and the Butterfly Weed before I started to raise Monarchs. I’d like to start a butterfly garden and try out some different kinds of milkweeds. From gifts 7-12 I would most like to receive the gift card! I would probably select the milkweed seeds in the tote as the gift I would give to someone. Day 12 butterfly gift card id the best idea of thr choices listed for days 7 through 12 of the Twelve Days Of Christmas topic. This gift is the most versatile for the receiver and encourages active conservation activity to help save monarchs too. I like the baby cube because it is just right for a shut-in to raise a few caterpillars and feel a part of the great cycle of life. I would like to receive the picks and holder to put in my butterfly cages. It would keep my milkweed and caterpillars tidy and easier for my preschoolers to observe. Do I love giving butterfly-themed Christmas gifts? Totes! Check out the natural butterfly tote to promote good cheer all year. And while it is better to give than receive, my favorite butterfly supply for raising the migration has been the BIG Cube Dimensions 24″ x 24″ by 24″. This butterfly house is large enough to support the entire Monarch life cycle, egg to eclosure, and milkweed planters–I place more milkweed in floral tubes right into the planter soil after the caterpillars defoliate the plants. On my breezy portico, the planters act as weights to stabilize the house, while the height of the mesh ceiling is perfect for chrysalis formation over the plants. Then the caterpillars are the same age and become butterflies together without any need to move chrysalises. A dozen or so caterpillars can be raised per house–my last few butterflies are eclosing right now before heading to South Florida with the other snowbirds. I would not mind having another house to raise twice the Monarchs for the migration next season! I would love to receive Day 8’s Tall Butterfly Cage! I started raising Monarchs late in the season last year, have only two cages and quickly learned that is not enough. I want to keep newly my emerged Monarchs away from hanging chrysalis and had to do a lot of cage shuffling last year because I didn’t have enough cages. I would love to receive the Butterfly Natural Tote Bag. As a college student I carry books around all the time and would love a beautiful tote bag. I like #7 the mesh pop up cage, those always come in handy and you can never have too many. I also like #10 the Butterfly Tote Bag, it’s beautiful and looks well made. I would Love the seeds to share with family and friends. I have been sharing my seeds and seedlings for a few years nowand have gotten many of my friends interested and involved in planting milkweed and we have all seen an increase in Monarchs and other Butterflies in our gardens. My favorite from gift number 7-12 is gift number 8,the tall butterfly enclosure. We raised and released 2,187 Monarch butterflies this year, which was our first year. There was always a need for more enclosures to minimize crowding. This would be a perfect gift for me! I would choose to receive the Butterfly Natural Tote Bag… what a beautiful tote bag to use and possibly start conversations with others about ways to help the monarchs. 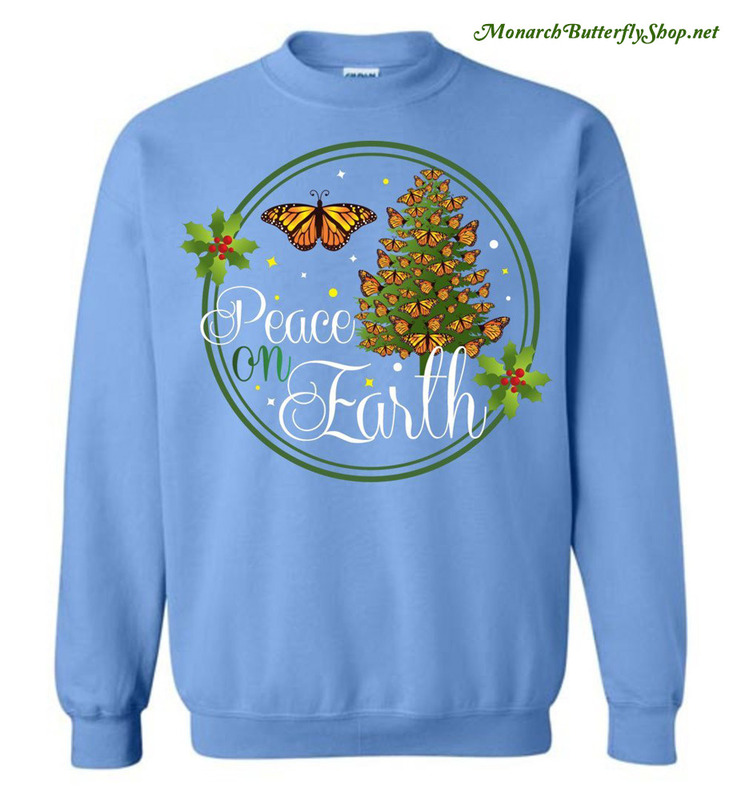 I love love love the Butterfly peace on Earth sweatshirt! I have a lot of T-shirt’s to make Monarch awareness to all that see them An are conversation starters! I love to tell people about them, that I raise them An make people aware of their endangerment… I can’t amagin a world without these magnificent creatures! I would choose to receive the Butterfly Natural Tote Bag… what a beautiful tote bag to use and possibly start conversations about monarchs. This is hard, but I think the gift I’d most like to receive is the Gift Card because then I could buy the other thing I’d most like to receive which would be the Floral Tube Holder! The tube holder is exactly what I need for the larger tubes that you started selling this past season (and that I love). I would give a small butterfly cube to a friend with kids. My daughter (5 y/o) and had such a wonderful time last summer rainy monarchs from eggs. And I want to share that opportunity with someone else. I am a 5th grade teacher in Minnesota and we release butterflies every year. My students love it! I would love to give the Day 12 gift of a gift card to our teachers in my building. That way they could use it for wherever their needs are in their science curriculum. I would love to have the Day 11 Milkweed seeds! I would have my students start them in my classroom and transfer them to the outdoors in pots. I would them bring them in for my next years classroom to watch the life cycle and release the Monarchs. This cycle could continue for many years! I absolutely love all of this gift ideas!! I’m currently working on extending my butterfly garden, Trying to collect all types of milkweeds. Reason why I would like to give and receive purple milkweed. But of course, the butterfly crossing sign, the puzzles, and the Monarch Buddies book are on my wish list! Any of these gifts ideas will bring awareness to support the beautiful monarch!! I would love to have the butterfly tower. I’m fairly new at raising Monarch Butterflys An have devoted a large section of my yard to plant milkweed An nectar flowers for the Monarchs as well as our local Butterflys… I was really sad as I did not see but only a few Monarchs this year in Northern California 😢 But I have high hopes that they will return this spring An so I am happy to get updates an info from this site so as I can learn more An improve my garden! Thank you for posting these ideas again this year. I would like to give or receive the Butterfly Tote, to remind everyone of our beautiful flying friends and allies. And because my birthday is December 3 (tomorrow). I believe the Milkweed seed collection would be wonderful…for me and my gifts! The caterpillars eat the leaves and seem to kill the plant and we have to replace constantly. I love butterflies and want to help them regain numbers! What a beautiful collection of colors! raising beautiful monarchs, painted ladies and beautiful big giant swallowtails. They were so very excited and we even had several hatch out on Christmas morning which made it extra special. They make great gifts for everyone and have started a great and environmental friendly hobby for both myself, my children and my Grandchildren. What a great and wonderful site to get all your butterfly needs!!! Would definitely love the Tall Butterfly Cage. As a newbie to this hobby I see this as a must have item. What a wonderful collection of gifts! I too want the butterfly and pollinator stamps, but they seem to have disappeared from the USPS website. Could they have sold out? In a way, that is good news. because if so, there’s a good reason to print more. OMG I am in LOVE with the tall cages. I supply the local school with monarch eggs and the tall cage would allow me to put the whole plant in the cage for the kids that has the eggs on it. Great idea and keep up the good work. I would love to receive the Milkweed seeds and/or a cage. My deceased daughter raised Monarch’s nearly every summer. In her honor, I’d love to raise Monarch’s to help the species survive the environmental destruction that is causing their numbers to dwindle. We have 20 acres of woodlands and meadow, but there is little milkweed. We have planted many species of flowers, shrubs and saved many species of trees to provide habitat for wildlife and pollinators. Thank you for your work. 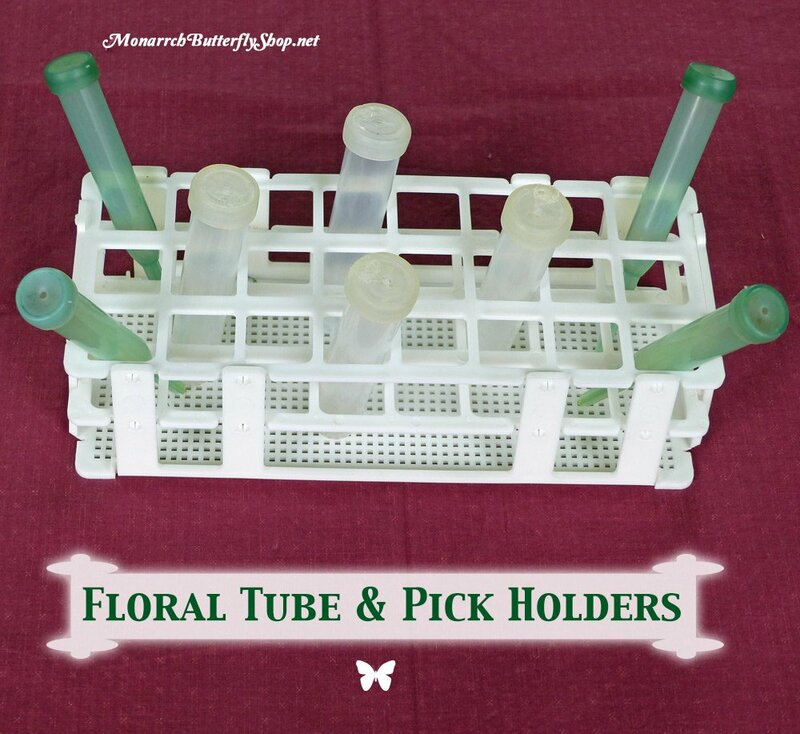 Well, it was a tough choice as there are several I would actually like to have, but I picked day 9- Floral Tube Holder Racks for Milkweed Cuttings as I had trouble with the holders for my floral tubes and this looks like a good fix! Thanks for all you do Tony! I would Love the assortment of Milkweed seeds! I would Love them because I could raised more butterflies helping nature is awesome! The tall butterfly cage/cube is a fantastic product. I would be excited to receive this as a gift and in fact just purchased one for my husband as a gift! We were lucky enough to borrow one from a friend to try raising our first batch of monarchs. We had a great success rate of 6 out of 7. The cube was plenty of space and was easy to access and to keep clean. I would highly recommend these cages. I must say that I would pick the milkweed seeds; because there are people out there that might not know about milkweed and how it helps the butterflies. They may plant the seeds, not only hopefully helping monarchs; but also produce beautiful flowers for other pollinators too! Also, if the recipient is able to get children involved this would be a great way to do it. It is basically the very start of raising monarchs. The children would be able to plant a seed, watch it grow, and hopefully get a female monarch to lay eggs then begin the raising process. They would be able to see the entire process from seed to butterfly! What a great way to learn and experience this joy for all ages! I think the tall butterfly cages would be the best Christmas present ever. 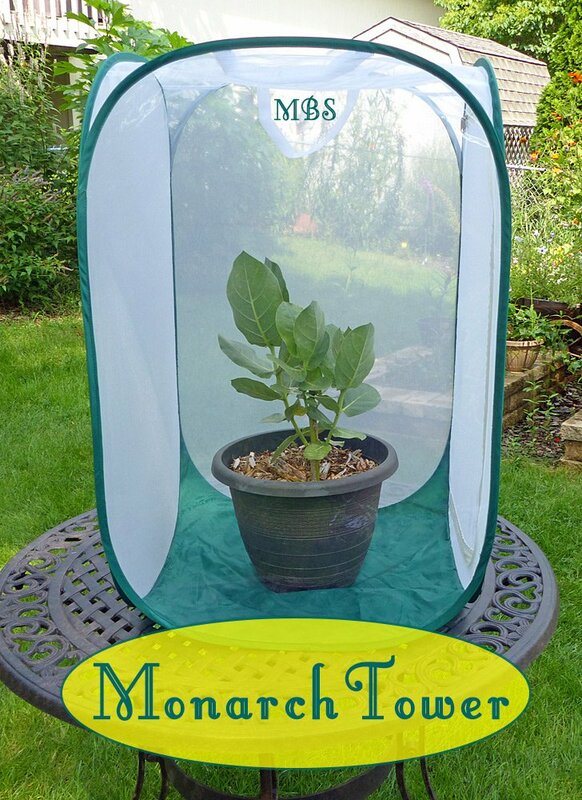 I have been thinking of raising monarchs at home and this would make it easy and fun! I like all the gift ideas. There are many scientists where I work and I would like to share these items with them to raise awareness that all pollinators, and especially monarchs need our help to survive the loss of habitat and the use of chemical pesticides. I don’t want us to become like China where the pollution is so bad that they have people to do the pollinating of vegetables, and fruit. I retired as a 14 year licensed daycare provider. The families I cared for remain very active in protecting the Monarch butterflies. I would love to “give” the butterfly cage to all of my families. These families learned from my butterfly garden! They saw the buttrfly cage containing milkweed, caterpillars, chrysalis and butterflies. Their enthusiasm continues to this day! After raising and releasing a Monarch this year, it only made me even more aware of their plight for survival and the need for more milkweed. I would give the milkweed seed collection to my friends since they were all aware of my butterfly I named “flutter”. I am planning on changing owe my vegetable garden to a hummer and butterfly garden next spring and I will be planting g more milkweed and butterfly bushes with a wildflower mix to help them. upgrade in my cages would be appreciated !! This year (2017), we officially became a Monarch Waystation and raised over 200 Butterflies from harvested eggs. (We tagged and reported this information). Of the second options in gifts, I would like the tall monarch raising cage best because I use several of these cages in my rearing project and have found it easier to access the taller cage (24″) with my trays of cuttings and larvae (which I have to clean & maintain daily). My second choice would have to be the gift certificate because with that I could replace supplies during the season. I would love to receive the varieties of milkweed seeds. They would brighten up my garden with the different colors. I would like to give the baby cage to a metropark where I live. They already have a butterfly house where butterflies are raised. I’d love a gift certificate for a large sum because I would love to have many of these items! These are great gift ideas. Personally I’d like the small cage to experiment with. I have lots of caterpillars, in CA, and I’m sorry for them on these cold mornings! I want to help them. I would choose the tall cube cage. We have a small supply of old aquariums to share raising butterflies at the elementary school where i work. The tall cage would give one more classroom a chance to observe the amazing metamorphosis. Wonderful gifts! My favorite to give and or receive would be the crossing sign. It would great in my butterfly garden and my friends would enjoy it as well in their gardens.. But I love the puzzles too, and the stamps. Great gifts to give and receive. What item??? I would Love Monarch Buddies, to give as a gift to the kindergarten class I volunteer in. I help with reading. I bought two of the cubes an the start of school and the kids have loved watching the butterflies go thru their change. After showing our great-photos of our monarch butterflies from tiny cats to release of the butterflies, they are completely captivated by raising butterflies. I would love to send them the children’s book and the butterfly crossing sign. We’re taking milkweed plants to them this spring. They range in age from 4 yrs old to 11 yrs old and there are 5 of them. So this will become a family project. I’ll be sending them links to keep them interested this winter. Beautiful gift ideas. I personally love the broach and the stamps. My great grandson would love the book. I would love to give the butterfly crossing sign as a gift because I think by more people displaying educational material, the more awareness about our pollinators would be raised. And it’s super pretty. I would love to receive the “Monarch Buddies” children’s book. I’ve been looking for a book for my granddaughter, since I’ve been fostering a love for butterflies in her. I already gave her a butterfly enclosure and she’s raised Gulf Fritillary butterflies with our passion flower vine. Next season, I’ll be sharing some milkweed with her. I would like the Butterfly Crossing sign. I became a Weigh Station to honor my son who passed five years ago. I have been raising monarchs for three and a half years now and the numbers keep going up every year. This winter I plan to build a huge enclosure to keep my plants, cats and butterflies safe. 100% the butterfly puzzles. Who doesn’t like puzzles and it’s great for kids thinking and problem solving, after all they are our next generation of butterfly rearing. Get them interested young! The puzzles are wonderful gift for Christmas to show what a beautiful creature the butterfly is and to take the puzzle when you’re done and place it in a frame to display the beautiness of the butterfly hanging on your wall so you can look at it everyday. The sweatshirt is a wonderful gift idea to share the wonderfulness of Monarch butterflies and how peaceful it is to watch one change into a butterfly and fly away knowing that you’ve helped continue their life cycle for many generations to come. I love the waterfall butterfly puzzle and the butterfly stamps!! Might order the puzzle for the family. I am putting the butterfly crossing sign, the puzzles, and the Monarch Buddies book on my wish list! These would be wonderful additions to my fourth grade science class. I teach grade 4 science and my students and I have planted a butterfly garden complete with milkweed and my students are excited and fascinated by watching the monarchs change from caterpillar to butterfly. They will keep their love and understanding of butterflies for life. Thank you for the information and tips that help us to help the monarchs! It would be wonderful to receive, and then use, the Butterfly Forever Stamps on Christmas cards I send to friends this year. I would write a note on the card to be “looking forward to Spring” as they would be receiving from me a special “Welcome Spring” gift and message. In the mean time, I would find Monarch Butterfly note cards,and prepare little packets of Milkweed Seeds to mail to them with info on the importance of planting Milkweed Seeds in order to see more Monarchs. This will not be a big surprise to them as I enjoy the lost art of writing letters, decorating the envelopes with colorful stickers,and sending these letters by US mail. I feel this could open up a whole new life experience for them,as it has for me. Nature is AMAZING! This is a good way to show support for Monarch Butterflies and spreads the awareness to many people. All such wonderful gifts so far. It’s so hard to pick just one. I would like the book Monarch Buddies Munch-A-Bunch of Milkweed by Lynn M. Rosenblatt. I choose the butterfly book because I love reading about Monarchs and ideas from Lynn Rosenblatt I know she is a butterfly lady on the Beautiful Monarch Butterfly site. I was excited to see her new book published. I would also read it to my grandkids, too. Butterfly lover from West Virginia. I would like to receive the butterfly crossing sign and place it in our monarch waystations we have created at our church pre-school. I would like either # 3 – the butterfly stamps to use on holiday cards and spread butterflies all over! or the Monarch Butterfly Buddies Bookto give as a gift to my “grandsons” in Arizona and Michigan. These young boys are likely to grow up and be a Professional Naturealist & they love to watch butterflies and all other types of insects! This is my first holiday season with this group, and I am excited to be apart of this wonderful community. I am establishing a new watch station on my campus, PSU Altoona. The sign would be a wonderful addition to the new site. My professors and fellow students would be amazed. I would love the butterfly crossing sign for myself. I would give the book to my grandchildren who have been amazed to watch the life cycle of the monarch from our homemade cage on my porch. We have had a fantastic time learning and going through the process this year and the kids can’t wait for next year. We have planted milkweed seeds in several areas around the house. We would love to RECEIVE Day #2 gift, Butterfly Crossing Sign. We would love to install at our community garden plot where many people have commented about our milkweed & Zinnias my 5yr gardener here, he plants from seed. Our goal each year is to raise & release twice as many as the previous year. This year was prolific and astounding, 122!!! I would love the pollinator stamps, that way you can spread the word we need pollination in our world! I also love the butterfly crossing sign for my butterfly gardens that I have here in N.C. Thank you Tony !!!!! I can’t decide between the butterfly sign for my garden and the beautiful puzzle . I love doing puzzles and the one you have with the butterflies and waterfall is so pretty. I also like the sign and think it would be a great maddition to my butterfly garden. So If I had to pick just one I would go with the puzzle for christmas and the sign for easter so I could put it out just in time for spring flowers! I would give any of the presents, but probably would give the stamps because you could spread the word with everyone that comes in contact with them. I love the sign. It’s bright, happy and makes me smile. A good way to spread joy and maybe some butterfly education to all who visit. Smiles, joys, and butterflies are in short supply these days-I’d love to help make it a little better. I would like the stamps, a good way to spread the color and beauty of our little friends through the mail, would use on my Christmas cards. I brought several of my chrysalides to work this year and got to share eclosing with my co-workers and let them do the release at the end of the day. Maybe have some converts to raising Monarchs?? Wonderful gift ideas. From teaching KDG, I have many monarch caterpillar/butterfly books. I’ve also had the puzzle on the life cycle of the monarch. From raising caterpillars in my classroom, I have many shirts with butterflies on them. Now that I’m retired, I have established my butterfly garden and would love to have the Butterfly Crossing sign in my garden. I absolutely love all of these gift ideas! I have pollinator stamps and put them on all of my mailings to spread the word of their plight, I love puzzles and those listed here are great! I have already ordered two seasonal Tshirts from here and will probably get more, but I have to say may favorite thing listed is the sign! I must have one for my garden! I will go nicely next to the way station one! Thank you for such great ideas! i would get the butterfly puzzles for beginners. i have just put in a butterfly garden this fall and have attracted a few butterflies, i enjoy watching them with my grandchildren. the puzzles would be for them to help get them interested in creating their own garden. i hope to have more next year. i had about 25 caterpillars this year. I would love to receive the Butterfly Crossing Sign to place in my garden. People who drive or walk by and visit would see it, and this would start conversations about the work we’re doing. The more people we educate, the better the efforts to help the beautiful Monarch Butterfly and other pollinators. All items are great choices, Tony. Thanks for everything you do! Tough decision, but I would go with the Life Cycle Puzzles (48 and 500) for my nephews and nieces. For myself, I’d like (and will) purchase the stamps. Interesting: when I went to our local post office some time ago, I was told that there was a surcharge on the pollinator stamps, so they were quite a bit higher than the $.49 face value forever stamp. I must go back and get clarification (or stamps). Fun contest–thanks, Tony. I would love to give the book Monarch Buddies to my Granddaughter because she has been amazed watching the metamorphosis of these beautiful butterflies with me for the past two years . As a gift for my 3-year old grand nephew, I would love to give the butterfly coloring book. Not only would he enjoy coloring, but the teaching aspects of the book would be wonderful to help become a steward of the natural world. First of all, thank you for the tools you provide to help those of us that are able to collect eggs and raise these important creatures. I’d enjoy receiving and giving the forever stamps. They are beautiful, practical, and educational in the sense that most of us feel any image on a stamp must be important, right? … and most folks may take a second glance at such beauty and connect the butterfly with pollination. For gift giving, I would do the book (potentially coupled with a cube, for someone interested in the butterfly-raising topic). That is something I plan to do for a gardening friend and/or as a party grab bag gift this season, where I know there is some potential interest. As a recipient, I would prefer the stamps. Thanks for all of your fun ideas and informative posts, Tony! Oa all the butterfly gifts so far, I find the Day 3- Forever Stamp Stocking Stuffers the most practical –and they are beautiful! I have to say, thought, that I really like the Butterfly Crossing Sign, too. Maybe not as practical a gift, but certainly lovely. Thank you for your blog. I always look forward to reading it. And thank you for the link to the Monarch Migration video. To me, that is what heaven looks like. I LOVE the pollinator stamps. I did not know about them. I just ordered 300 to both give as gifts and to use. What a great way to spread the word about helping our pollinators. Thank You for pointing these out! I speak to classrooms Pre-K through 2nd grade about protecting our monarchs and other pollinators habitats. I include a story time and then I like to leave the class libraries the book as a gift on the subject that is fun and inviting to the kids. Something they will want to read again and again. This looks perfect. Thanks for the ideas. I like the monarch Christmas sweatshirt. This is the first Christmas monarch shirt I have ever seen, and it’s beautiful! I often wear monarch shirts and my monarch hat so people comment on them and I chat with them and give them information on monarchs. I would love to gift the Monarch book to a great niece that would find it so interesting! She has parents who would keep her interest alive. The gift I would like most is the cage. I’m just new to the plight of the flight & have begun planting my garden. All the items are wonderful, though! Wow, you have done a wonderful job on creating really beautiful butterfly items. I read some of the comments and am so proud to read what others are doing to help the Monarch’s. I personally love the blue sweatshirt (that is my favorite color). Having butterflies on a Christmas Tree would be the added touch. Perhaps you could sell strands of Monarch butterfly lights for my (our) Christmas Tree. I love doing puzzles. My two favorite thinks are Cardinals and Butterflies. Money is tight and I have been blessed b y my friend giving me my Cardinal (bird) puzzles. I would just love to do your Butterfly puzzles. Thank you for all your help in teaching us how to care for the Monarch’s. Hope you have a happy Thanksgiving. God Bless! Well done MR Monarch!!! You’ve picked some GREAT gifts again!!! 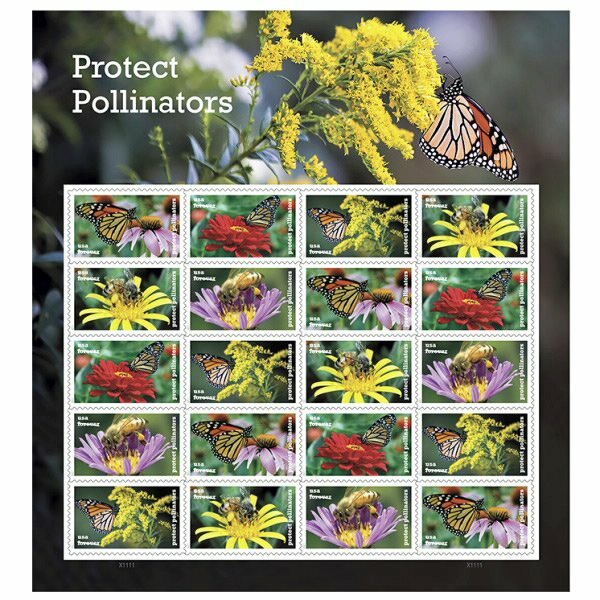 The “Protect the Pollinators” stamps would make a great addition to envelopes when trading seeds with other Monarch & Milkweed raisers!!! Happy Turkey Day!!! I would give a cube to a friend that raises Monarchs for an Elementary school and county parks programs. I would want the same. This year we raised tagged just over 200 monarchs and we could have used extra cages. Hopefully next year will be even better! I would love to receive any of these wonderful gifts, but the one I’d like to GIVE the most is the Day 6 Monarch Butterfly book. I am a teacher, and this fall, I brought a chrysalis to class, and my students experienced the wonder of witnessing it eclose. We watched it pump its wings full of fluid, dry its wings in the cube, and open and close its ever-growing beautiful wings throughout the day. We then released it at the end of the school day and wished it well for its journey to Mexico. My students were in awe. I believe education is the key to solving our critical problems with pollinators, especially habitat issues including the decline in milkweed, and the increased use of herbicides and pesticides. “Lighting the fire” under the next generation is our best chance for continued success in trying to address these serious issues. I also love the puzzle for the same reason. It educated our kids about the fascinating cycle of the Monarch. I will be purchasing these for my grandkids too! I think I would like to give the butterfly t-shirt to my granddaughters the most. This year, they were both able to take butterfly cages with several cats in them so their entire class could enjoy watching the monarchs chomp away and then emerge from their sleep. I would like, and would live to give out day #2 Butterfly crossing sign. It’s a very one of a kind item. Never seen it before. Thought it would be real cute to hang up next to my fence where everyone would come in a see it. And or on the fence right next to where I have my milk weed. (Durring the season) every is indoors for the winter…. Of the first 6 gifts, I would most love to receive or give the Forever stamps. They are functional and have immediate value. They also spread butterfly love to those who receive the letters … even if they’re bill collectors! Many of my family and friends have “too much stuff” so I appreciate consumable gifts like stamps. And, I didn’t even know they had monarch edition ones! I would love to give the butterfly crossing sign to my dad. He has worked hard his entire life and finally saved up enough money to buy back land that his father owned when he was a kid. It is now part of CRP land and we planted acres of milkweed and wildflower seeds this fall and can’t wait until spring to see what grows and how many butterflies come to visit! They are ALL great! I’d pick the Monarch Butterfly Book for kids. I gave some Monarch cats to a co-workers 6 year old daughter to raise this past summer and though I directed them on how to raise, I’d love the child to have some knowledge on these beautiful butterflies! Gave the child 2 sets of Monarchs to raise, and she released them all successfully. I never met the little girl but her father video taped her the moments of the release and I’ll tell you, the smile and look on that little girls face was priceless! I felt so good knowing that just maybe I had something to do with the little girl being excited about nature and excited about those beautiful Monarch Butterflies. I would enjoy receiving any of these items as a gift, the 3-butterfly brooch, forever stamps and butterfly crossing sign being my favorites. But I love GIVING gifts at Christmas even more than receiving them. Therefore I would pick the children’s Monarch book, since I want to instill my passion for the raising Monarch butterflies with the younger generation. I became obsessed with the Monarch when my oldest son went to kindergarten and his teacher raised them in class. This is longer ago than I care to admit, but I have been collecting cats and sharing my passion of these awesome creatures ever since then. One of my daughters-in-law has embraced the love of Monarchs and she and my granddaughter have become as obsessed as myself with raising them. We were so excited to see the large increase in the number of cats this year. Maybe if we pass on our passion, knowledge and appreciation for the Monarchs, the younger generation will see larger and larger numbers of them as they grow up. God created a “wonder” with the Monarch, from the metamorphasis to the migration. This book would encourage learning about this “wonder” and also open conversation to become ever thankful to God for the beauty of nature all around us. Thank you so much for your great website and newletter. I love the butterfly puzzle too but what’s with the preying mantis in the fore front?? Yikes! Well hard to choose …… I’m going to give that blue sweatshirt to a special butterfly buddy because the design is so wonderful and I know it will be loved. It also shares the need for peace on earth and Monarch (and all butterflies) preservation and expansion of current habitat…….the “butters” bring such peace, joy and happiness to my garden and neighborhood! I would give the children’s book to my grandkids, so to instill a love of mine. I would love to receive the sign for my monarch habitat. Would love the sweat shirt it is beautiful and also love sign for my butterfly garden. I have to admit I’m a sucker for anything with Monarchs on it! Of the six thoughtful gifts you’ve collected for your first six days, the one I would most love to receive or to give (preferably receive, LOL) is No. 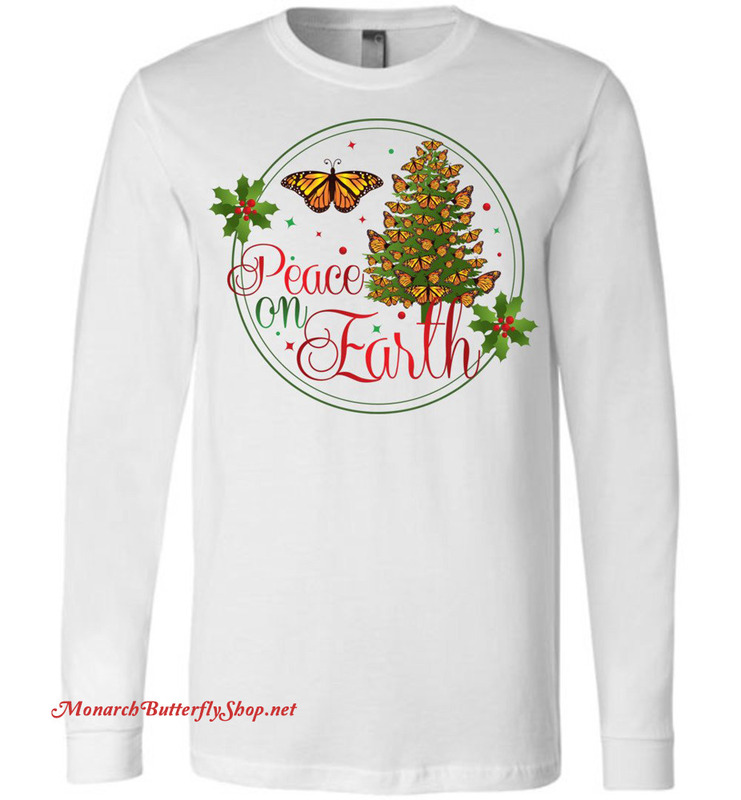 1, the Peace On Earth Monarch Butterfly Christmas T-shirt. I love that it depicts a close-up of a beautiful Monarch butterfly and that the many Monarchs on the tree evoke both the Christmas season and Monarchs overwintering in trees after their migration. So pretty! Of the first six butterfly gift ideas: I would love to gift the Monarch Butterfly Book for Kids to my daughter. She is about to become an elementary teacher and I hope to provide cats for her students to watch grow and transform. I am torn between two different items as to which would be my favorite to give: the Butterfly Waterfall 1000 piece puzzle is perfect for my 93 year old very talented mother-in-law. We give her a 1000 piece puzzle every Christmas and she still enjoys them very much. My second most favorite item would be the Monarch Buddies book for my two grand-daughters. We have already given them several books on butterflies and have taken them to butterfly conversavories multiple times. It makes me so happy that we have four generations who all share a love of butterflies and all of God’s creations. Of the 6 Butterfly gift ideas I would love to get any of the 5 Butterfly Broches. I would wear it proudly all year long. The beauty of these pieces is sure to get comments from everyone who sees it. I could not think of a better way to get people talking about these beautiful and important creatures. Of the six gifts so far I would love to give to my granddaughters the Monarch Life Cycle puzzle. The granddaughters enjoy putting puzzles together with “Papa” and we have had an awesome time releasing our Monarchs this year. The puzzle would make the winter go a little faster so we can again begin our search for the Monarchs next spring. I think the book ( for me for all my grandchildren) because it shows the circle of life in an understanding fashion. It shows how life starts, what nourishes it, allows us to enjoy life and how it repeats. And then hopefully shows up in how my grandchildren treat all living things. The butterfly sign is my choice so everyone will know I raise butterflies . It will complete my yard and cause others to ask questions which may spark an interest in them to plant milkweed. The seed is great for those who are interested in starting a butterfly garden. I would not mind adding a few varieties myself. The butterfly crossing sign is my favorite gift idea! I would LOVE to have one for my butterfly garden! As I sit here typing this comment on why I would appreciate the Butterfly Crossing Sign I’m thinking of my good neighbors walking by and wondering why all my plants are just stems. Here in Southern California I have had a dozen new cats show up in the last two weeks and wipe out my ‘just coming back from being cut back’ milkweed collection. Lucky for me the cats earlier in the year totally ignored my ‘hairy ball’ plant–guess where they are chomping now? I’ll be purchasing the sign so as to let my neighbors know that I care, unfortunately we don’t get all the pretty butterflys from the sign visiting us, boohoo! Thank you for the opportunity to win prizes. Who doesn’t like that! I like number 2 the butterfly crossing sign for myself. I have started a butterfly garden and this would look really cute in it. I would give number 6 Monarch Buddies to my grandsons,they like doing the butterflies with me when they visit. My 7 year old likes to read and my just turned 5 likes to have the be read to,especially about nature. I would love to give my grandbabies the Monarch Buddies book. Certainly the puzzles would be the most cherished also. All your gifts are beautiful! My husband & I have 2 darling grandbabies ages 6 & 7.. little boy Dante and little girl Raven. I instill the love of nature in them.. we never throw away seeds from anything we eat.. we plant them. We point out all the beautiful butterflies and birds whenever we have little nature walks. I am looking forward to ordering our Butterfly Kits. 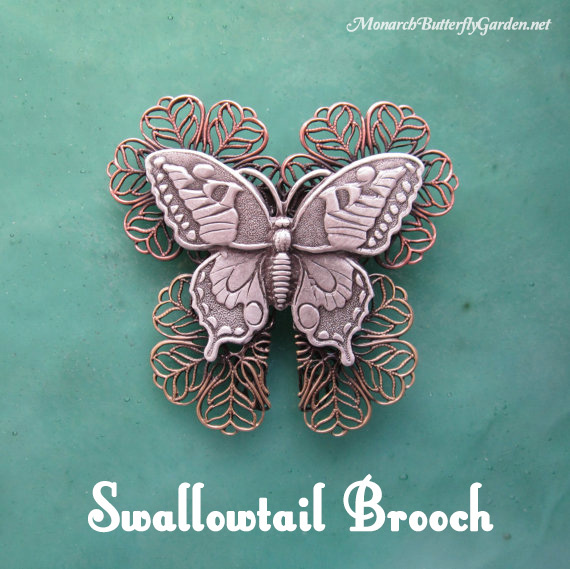 I would love the butterfly brooch because i love butterflies and i collect brooches. Its also beutiful would look nice on a sweater or jacket! I would like the 48 piece Monarch puzzle to send to my Great Grandson. Logan, who lives in Florida. 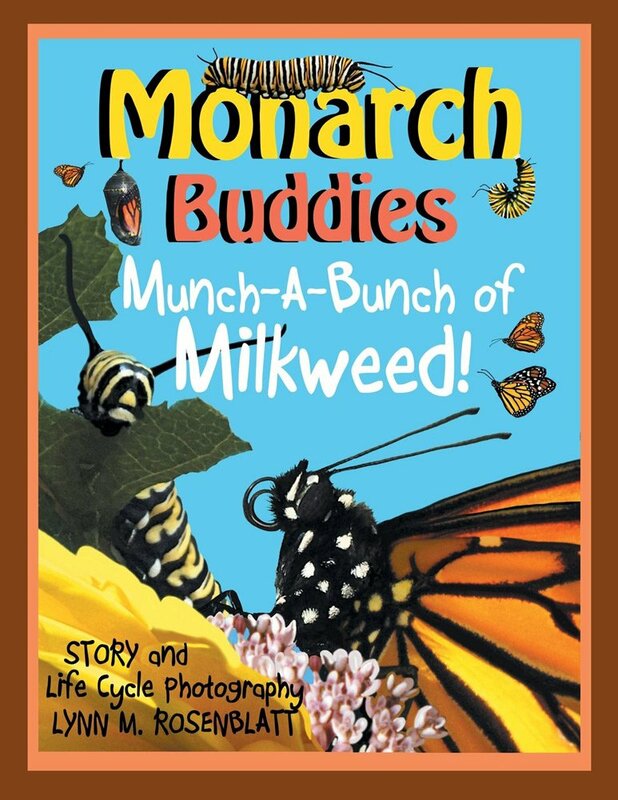 I would love to receive the children’s book, Monarch Buddies Munch a Bunch of Milkweed! I am a second grade public school teacher and butterfly life cycles are part of my science curriculum, and since I am the school’s garden coordinator, my class is doing a special Save the Monarch project! We could use this book in our library! The Butterfly Crossing sign is my favorite! I live on a busy intersection and most people in my neighborhood have seen my butterfly garden and have loved seeing the butterflies fly across the street., This will give extra protection. Thank you for a thoughtful gift. As a veteran Kindergarten teacher who is the garden liaison and teaches 100’s of students each year to love butterflies , bees and gardening , any of these who be perfect. But my 1st choice would be the Monarch Book because my class is fascinated by watching the lifecycle happen right in our classroom. Thanks Tony for keeping the Monarchs healthy and happy. The Butterfly Crossing Sign. This being my first year of butterfly conservation/sanctuary, I have planted milkweed and native nectar plants galore. I will need this sign when my neighbors see all the weeds growing in my yard and are wondering why I’m not mowing. I would love the Monarch Crossing sign! That way my neighbors won’t think I’m a crazy lady with a bunch of weeds in her garden;) the giant milk weeds are there for a reason:) And also the children book or life cycle puzzle!! I teach kindergarten and this would be a perfect addition to my lesson about monarchs and their lifecycle in the spring! I already ordered and received the Monarch Crossing sign which I will put in my garden this spring. I love how they pictured real butterflies from North America! I also will plan on getting the butterfly stamps. Love them. Both of these gifts are reasonably priced. I do like the shirts, too, but I have too many already. I would like to see what all the children’s book, Monarch Buddies, includes inside before I would consider purchasing. I love that you are compiling these items for us to order. What a great service! Thanks, Tony, for all you do for the Monarchs and for we who follow you! Thank you for all the hard work you do to help us throughout the year. It is very much appreciated. These gifts are all so very wonderful. It would be hard to choose one. I met a nice dental hygienist in October & was telling her how I raise butterflies. She was so interested that she gave me her phone # & wanted to learn more about it. She has 3 children & I think it would be great if I could get her to also experience it with them. So even though I would LOVE a beautiful T-shirt I think that either the puzzle or the book for the children would be something that they would enjoy. Since Christmas is more about giving than receiving I think it would make a lovely gift. BTW, my shirt size is medium. LOL!! Have a happy & healthy holiday 2017. I would love to give the Monarch Buddies book to a child because of its educational value. All my life I was unaware of the importance of milkweed to Monarchs until a few years ago. Since then, I am actively cultivating it in a one acre plot on my property. Imagine if children knew of the importance of this plant! They could plant those seeds wherever they found one adrift on the wind while outside playing becoming modern day Johnny Appleseeds. I would love to receive the forever stamp collection to remind myself and others of the importance of gardening for pollinators and butterflies. For example, many consider Goldenrod a weed or pest due to their allergies. Both milkweed and goldenrod are weeded out of gardens – I was guilty of doing this myself! Now I am sensitive to the importance of these two “weeds” and they are allowed to grow with wanton abandon on my property! These two gifts may help to improve their chances of being cultivated in other yards rather than eradicated. I would love one of the Peace on Earth shirts in any color in a 3XL but if unavailable in a 2XL. I raise the monarch from an egg every year in my classroom. I always tell others that you can see God through the life cycle of the monarch. I know that the Peacemaker on this earth is God. I would love to show others the shirt and tell them how the monarch is truly a miracle performed by God every year and is our Peace on Earth. I pray before I leave this earth, I get a chance to go to Mexico and see the thousands of monarchs. That would be such peace and joy for me. The Butterfly Crossing sign caught my eye. I’d like to put it on my front fence next to the Pollinator Habitat sign that’s there. It would no doubt catch the eyes of passers-by and hopefully make them think about all of the necessary insects, perhaps inspiring them to plant beneficial native plants and flowers. Years ago, I removed the front lawn and put in a large garden planted with butterflies, bees and hummingbirds in mind. It is visited by many butterflies during the Summer – this year had the most Monarchs ever! There is no doubt in my mind that anyone would love to have or to get as a gift. The Butterfly Crossing Sign. I would put it in my front yard to encourage neighbors and passer bys to come into my garden and enjoy all the Butterflies that fly in and out of my garden. I think The Monarch Life cycle puzzle would be a lovely gift to a young child to encourage them to learn all the fascinating stages of our beautiful Monarch butterfly. The book Monarch Buddies would be a great and encouraging book for young children to learn all about the world of butterflies in our gardens. I must say, this was a difficult decision to make because all the gifts are amazing! That being said, out of the first six gifts, I think I would like to receive the butterfly crossing sign because it would be perfect for my backyard as these are the exact butterflies I see during the summer there. (I would like to give the gift of the butterfly pin, I actually ordered some to start my X-mas shopping;). Great choices!! In looking over the options, all the gifts have been lovingly created. It was hard to choose with each having its own merits. Ultimately, I would love to receive and give the butterfly crossing sign for a couple of reasons. First, I really like how the sign can be displayed all over in multiple climates. Hence, a great gift. Second, I love the visual attention the sign brings through its choice of colors and butterfly species. When my little garden is ready, I would love to put the butterfly crossing sign near the Certified Wildlife Habitat sign I also want someday. Together, they would be a strong reminder that it’s not just our pollinators that need our help, but wildlife as a whole. In that respect, I love how the sign goes beyond who I know and can make a stranger pause and think, even if it is just for a moment. Because if thinking about our declining butterflies can also get them thinking about our unhealthy bee population, the lack of hummingbirds in their area, etc. all the better to motivate someone into helping the wildlife near them and moving away from the traditional yard. Thank you for all the wonderful choices to consider! Thank you Tony for all the work you do to keep butterflies on our minds. Other emails I skip on by but always are drawn to yours. Instead of my traditional gardens, I’ve designed a butterfly garden, that actually looks like a huge Monarch. Each section is a different flower. I’d love to add the butterfly sign to make it even more beautiful. Can’t wait for next summer to start over. I lost a few, I’ll keep better records next year. But, was able to release 172 monarchs this year. I LOVE TONY FOR SUPPLYING HELPFUL INFO & ALSO LOVING BUTTERFLIES! I love all of the items, especially the brooch. It reminds me of loved ones that come to let me know they are in a new life and alwayscwuth me. I would live to give one one of these lovely brooches to my friend, Teresa, who just had her mother pass from cancer. I told her that butterflies are her mother reminding her that she is free, happy, lovely and with her. I’d pick the brooches. They’d make great gifts for the women in my family. The Butterfly Crossing sign would be an awesome addition to our wetland. We dug up our wetland this fall and replanting it with all native Missouri plants with emphasis on milkweeds and other butterfly attracting plants. It would look so cool amongst some of the shorter plants. Hello! I would LOVE to receive the Monarch Butterfly Crossing Sign as a gift for my garden! The colours are vibrant and I appreciate the bit of humour! I also love the Monarch Butterfly Book for Kids… My daughter would enjoy this book, not only for herself, but to share with her classmates. Great learning tool for kids to discover the magic of Monarchs. Thank you for all that you do! For the first time this summer I raised 12 butterflies with my grandkids. They all survived and we got to release them in the sky. It was such a great experience to see the joy on their faces as they released them. I know they would love the butterfly book to relive the growth of the butterfly. The butterfly brooches would be my choice. Reasons: lightweight, variety in metals, different designs on butterflies, and interesting design on the multiple large butterfly brooch. Thanks. I would most like to receive the Monarch life cycle puzzle because I could put it together to display it next year for a presentation I am giving to a group of naturalists about Monarch’s and how to help them. I’ve been working to get milkweed going in my yard and a pollinator butterfly garden for a few years and you have some great looking gifts for my like minded friends. Looks like I have a new online place to shop for gifts! I would love to get the Peace on Earth shirt and will probably give it to myself! I like the long-sleeve feature and your shirts are very high quality! Thanks Tony!! We would love the Butterfly crossing sign! As co-leader of my daughter’s Girl Scout troop, I’ve been helping the girls plan a Monarch Waystation that will go in at our local public library next spring. We just recently planted the milkweed seeds we have gathered using your helpful instructions. We are hoping that having the garden at the library will really help with the community outreach part of their project. The sign would be a perfect addition! In seeing the wonderful gift ideas,I believe I would want,The Butterfly Crossing Sign. I just moved into a community that really isn’t using any ways of bringing in pollinators. There are lovely flowers here and there but none that would really keep The Beautiful Butterflys in an area to lay eggs and feel at home. I’ve planted a few beds of different flowers this last yr that I saw alot of different Butterflies,Hummingbird Beehawk,and many others. It really showed me what We really had in our area. Let me begin with a sighting – I was surprised yesterday, November 18, to see a monarch feeding on my tithonia. Here in Virginia Beach we had our first frost yesterday morning and I almost cut the plants down. Now I’m keeping them up as long as they are blooming! I like the Monarch book for kids -wonderful gift to teach them about monarchs! If I was to receive one of the gift ideas, I’d most like the monarch sign to post in my garden. Raising monarchs has become a surprise hobby since purchasing my first milkweed three years ago. The Butterfly Crossing Sign. It shows neighbors and gardeners that butterflies are in the area. It is also colorful and a great addition to a garden. There were a few things that I really liked but I think that I would like the most is the Monarch Butterfly Book for Kids. The reason being is that it would help me to start sharing the important news and story of the butterfly! I would love to receive the butterfly crossing sign. I am co-organizer of our Garden Club at our middle school and we created a pollinator garden in the past year in the hopes of getting butterflies to visit and lay eggs. For years, my own children and I have watched caterpillars on our parsley, put them in the caterpillar tent, and hatched beautiful black swallowtail butterflies. We now help monarchs along as well. Too many kids at school have never seen this in real life so we decided to get a pollinator garden started at school. I would love to give the forever stamps to my co-organizer of Garden Club. She is also a bee keeper and loves all sorts of pollinators! I wish we could get a poster of the pollinator stamps to display at Garden Club…the stamps are beautiful! I think the butterfly brooch is an absolutely wonderful gift idea that I’d like to give . my 87 year old mother is now raising butterflies and I know she would love to have some butterfly jewelry to wear proudly. I would love to have the Butterfly Crossing Sign. It would be just perfect in the butterfly garden that I planted in the common area of our co-op community. It would tell the story of what the garden is all about to those who did not know. I love the Forever Stamps because not only are they beautiful but a reminder to all those that receive my letters of the need to enjoy and protect our butterflies. These stamps are something I had been wanting for a long time and am very happy they are available. I would love to give each of my thirty 3-year-old students every gift above, but especially the new book 📚 on Monarch butterflies, Monarch Buddies: Munch a Bunch of Milkweed, because they loved raising Monarchs at school and with this book they would be able to share this joy at home as their family read this book to them & extended their learning. I like the butterfly crossing sign. I am new to butterfly community. I just planted some milkweed plants in a special flowerbed. I have been trying to find a little sign for that area to mark it as special….my own little butterfly nursery. Thank you. I would most like to give or receive the Protect Pollinators stamps because I collect stamps and only use special issue stamps on the mail I send. These stamps are particularly beautiful and colorful and draw attention to an important environmental issue. I would like to receive the “Butterflies All Over” puzzle because 1) I like to puzzle, 2) I like that particular design the best, 3) I can enjoy it any time of the year, especially in the wintertime when I need a little extra color in my life and 4) when it’s cold out and the butterfly magic can’t come from the outdoors, I’ll soak it up in the form of a puzzle. I would love the life cycle of the butterfly puzzle to use in my preschool classroom. And the book about Monarchs/Milkweed children’s book. I’m so excited to teach the 3 and 4 year old about monarchs, and got to bring in a chrysalis to eclose during class–the kids were fascinated! The puzzle would be wonderful for my children to reinforce the amazing butterfly life cycle. Although I would love the Butterfly Crossing sign for my Monarch way station the children’s books are probably a better way to make an impact on the next generation of pollinator conservationists. The battle has only begun to save our ecosystem and future generations will lose the many beautiful creatures God has blessed us with if they aren’t informed and willing to join the fight to save them. 1. I have given talks to classes of children grades K-5. This would be a good tool for my presentations. I could read it to the little ones and the bigger students could read it themselves. 2. I give a couple of presentations every summer at the retirement community that I live in. I haven’t seen the book but it looks like it might work very well with some of my friends that “are slowing down” a little. 3. It would be a good addition to our retirement facility library for people to read for themselves. Thanks for all the good gift ideas that you offer now. The shirts are beautiful!!! Happy Thanksgiving to you and everyone! I would really like the life cycle of a butterfly puzzle! I teach preschool in Southern California, and we have a beautiful milkweed garden that we planted over a year ago in front of our classroom with lots of visiting monarch butterflies. I use your awesome cubes and bring the eggs/tiny caterpillars in my classroom to protect them from tachinid flies. The children love watching the life cycle right before their eyes! We name them when they eclose, and release them, while the children wave goodbye! The puzzle would be a great addition to our materials for learning about the amazing Monarch Butterfly! I also grow a huge garden of milkweed at home in my front and backyards where butterflies live from Spring through Fall! I bring some caterpillars from home to class in your cubes so we watch the lifecycle quite a lot. Pick me for the puzzle, please! I would give the puzzles to my son and his family who love putting puzzles together, and also get one of the butterfly crossing signs for our garden here at the retirement village. Of the first six gifts, I would most like is to receive the Raise the Migration premium long sleeve shirt in royal blue. The orange butterflies against a royal blue shirt are highly visible, and would announce my butterfly politics to the entire city of Nashville. I love the butterfly crossing sign. I raise hundreds of Monarchs and other species every year and do get comments on my Monarch Waystation sign. I would like to add the sign to another part of my garden. What a huge group we have! The gifts are like a kid in a candy store. To recieve, a christmas shirt, christmas and butterflies together! To give or receive, the butterfly crossing sign. I love the brooch, too. My mother passed away in September and as her health declined we shared many moments raising monarchs. I’d enjoy receiving the butterfly crossing sign for our garden. My husband and I raise Monarchs and the sign could become a great conversation starter for those who don’t know about what we do. My second choice would be any of the butterfly books to donate to my grandkids’ elementary school. Children need to be made aware of the needs of God’s creation, and the younger they learn, the better! I would love to receive several of these as gifts! I adore the butterfly sign crossing and it would bring attention to the plants and butterflies in my yard to passersby. I also enjoy sending notes of encouragement to friends and family. Adding a lovely pollinator stamp would be so neat! And the butterfly sweatshirts are always so comfortable. Great choices for 2017! The stamps and the sign are great. The Monarch lifecycle puzzle is pretty neat too. I just realized I didn’t say why. Each summer my son (he’s 4) raise monarchs in danger. If I find eggs or cats in harm’s way ( like middle of a playground bc there’s climbing milkweed sprouts) we adopt and help them out. He’s more gentle and observant because of it. I think he’d like the sign or the puzzle. I’d give any gift to him. I would love to receive the butterfly crossing sign as a gift. It would serve to pique curiosity as my neighbors walk by. I could teach them about butterfly gardening, raising monarchs and imperiled pollinators. I love the butterfly crossing sign. What a great addition it would be to my butterfly garden. I also love the puzzles. I have always loved doing puzzles. They always invite groups of people to get together and spend time together. It’s been a great year for me and my butterflies. I still have 11 cats to raise at this time of the year! 1: love butterfly crossing sign. Fun, unique way to show off your butterfly garden. 3: The butterfly book for children. What a great way for children to get involved and learn about the life cycle and the importance of the butterflies ! I would love to receive the Butterfly Crossing sign as a gift. It would make a great addition to my butterfly garden. I’d smile as I have my morning coffee there. I would like one of the puzzles because I find doing puzzles relaxing. My favorite (even though I LOVE ALL) would have to be the Children’s Books. I would love to gift them to the teachers at my children’s elementary school. It’s important for our children to know the importance of helping the Monarchs and also other creatures of our earth. My neighbor got me into raising cats this past summer and I successfully raised and released every one of the 90 I found this past year. I can not wait for the warmer seasons to come back so I may continue. I miss my babies. My favorite gift choice is Day 3, The Forever Protect Pollinator stamps. I have always liked stamps, never ever byuying the boring rolls when there are always so many intriguing and wonderful choices available. There are three different stamps here that actually have Monarch butterflies on them! And what is so wonderful is when you put one of these on an envelope you are sharing it with so very many people as it moves through different hands to reach its recipient. Makes whatever envelope it is put on very colorful, pretty and attractive, too! I would love the Pollinator Collection of Forever Stamps; I’d use them for the Christmas cards I’ll send this year. I like the Peace on Earth shirt and the butterfly puzzle shaped like a butterfly. Hi, Tony, & thank you for helping us help the butterflies. For me, the go to gift to give or get would be the bright yellow “butterfly crossing” sign. I love the monarchs flying by & their beautiful colors. They help me fight the winter doldrums. When I think of the upcoming cold winter days, with the snow blowing all over & coming down threateningly AND peacefully at the same time, a glimpse of that bright yellow weather proof butterfly sign in our pollinator garden would cheer up any friend of mine — or me — immensely, a sign of spring and summer, hope and cheer. Flutter by, butterflies! I love my Butterflys as much as my Friend Lisa Thanks to her get me started on this we had a good ole time do it this spring to together Thanks again Lisa. I think it would be awesome to give the Forever Monarch stamps. I would put the stamps on my Christmas cards and the letters I write. It would bring awareness to Monarchs and open conversations where I could get others to join our cause to Raise the Monarchs. Many people don’t know how endangered Monarch butterflies are. Seeing the stamps might start a good conversation about them. I also think I might give stamps to my new neighbor who is interested in planting milkweed to help Monarchs and in registering to be a Monarch Waystation like mine. The stamps are beautiful! I would definitely love to recieve, and would give the “forever stamps” celebrating our much needed pollinators. They are absolutely beautiful pieces of artwork, are useful to everyone, and remind us of the necessity of increasing our pollinators, including Monarchs!! I love the butterfly crossing sign. It would make a perfect addition to my butterfly photography portraits, or a perfect sign for my garden. Would love everything raising cats is my passion !! I love your shirts!! I have 4 of your shirts so far and just ordered one for Christmas. I would love to receive and give as a gift the puzzles. I, my daughter, and my granddaughter used to work puzzles all the time with my Grandma when she was alive. Now, every time I visit my daughter and grandchildren we work puzzles. I love the closeness we get when each of us are competing for pieces! It’s fun!! I also started teaching my granddaughter and grandson how to raise butterflies. We have had the painted ladies twice and released at least 14 of them. I am collecting all the supplies to raise monarchs. I would love to try to grow my own milkweed for them. So glad I found your website!! I look forward to learning all about Monarchs!! When my mother passed away, we scattered her ashes in the local park. When we were leaving, a monarch flitted around us. It landed on my niece’s head. My sister scooped it up in her hands where it very comfortably stayed for what seemed like forever!! She let it fly out of her hands. It still gives me goosebumps thinking about it. The next day, when I left to drive home, I went to the park to say goodbye. To my astonishment, the whole hillside was full of white and of yellow butterflies. It was absolutely beautiful. Butterflies have always had a special place in my heart ever since. I don’t really want to place 1st or 2nd. I would love to come in third place so as to get the milkweed seeds. Anyway, Merry Christmas to you and your family !!!! I love it all! My votes would be for the white butterfly sweatshirt and the Forever stamp! 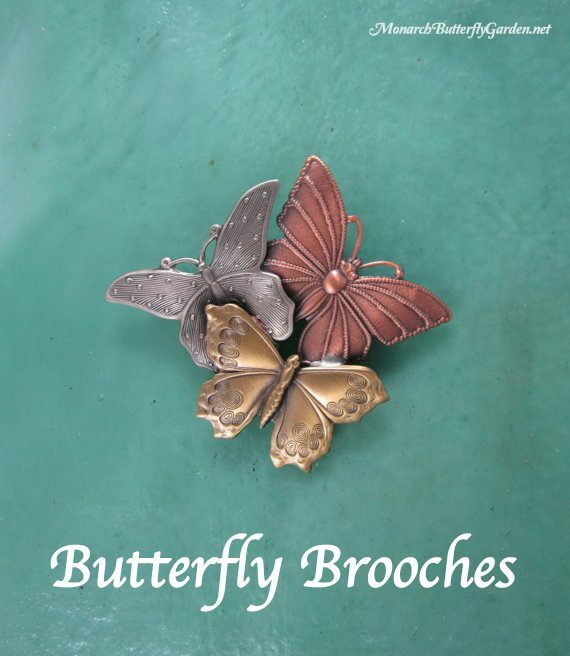 The butterfly brooches would make great little holiday gifts for some people in my office. All are so well done. If I can only pick one I will choose the Polinator Forever stamps. That way I can get each stamp to remind people to use polinator plants in their gardens. I am in a very small space that is very limited to what I can grow so pollinating plants it is. I always have Swan Milkweed and this year I mistakenly bought a giant Milkweed. It grew to my roof. Was gorgeous and had Monarch catipillers. I just found your website a few months ago. Love it. It is so wonderful to know there are so many avid Monarch enthusiasts out there. Thanks, Tony. You are much appreciated. I love the Forever stamp Butterfly sticking stuffer for myself as well as to give to others. This is a great idea to bring awareness of all the beautiful pollinators. Also love the monarch butterfly book for kids to educate, wish they had them for adults too. I’d love to receive the “Butterfly Crossing” sign to put up beside my newly created wildflower garden because it would be so fitting. This would be a great way to share with my friends & family & any garden visitors my new-found passion for all pollinators, especially butterflies. I love the butterfly crossing sign! It would be perfect in my pollinator garden. I’m hoping to plant even more milkweed next year. I like the book also, but depends what level. I teach third grade. This year I created my own flipcharts about the butterfly lifecycle and included my own pictures and videos of each stage. We raised one from an egg in our classroom. They were so excited to see the changes and then see it fly away. I would like to give the butterfly brooches to my wife for Christmas. My wife loves to see the butterflies in my Waystation 5540. I’d love to receive the forever stamps. They are beautiful and would be great I’m cards. I’d love to give the Monarch lifecycle puzzle because my husband’s family loves puzzles. Thanks for this contest and all your good work Tony! I would love to receive the Forever stamp stocking stuffer ‘Protect Pollinators’ as then I could promote the butterflies and pollinators with every letter that I send. 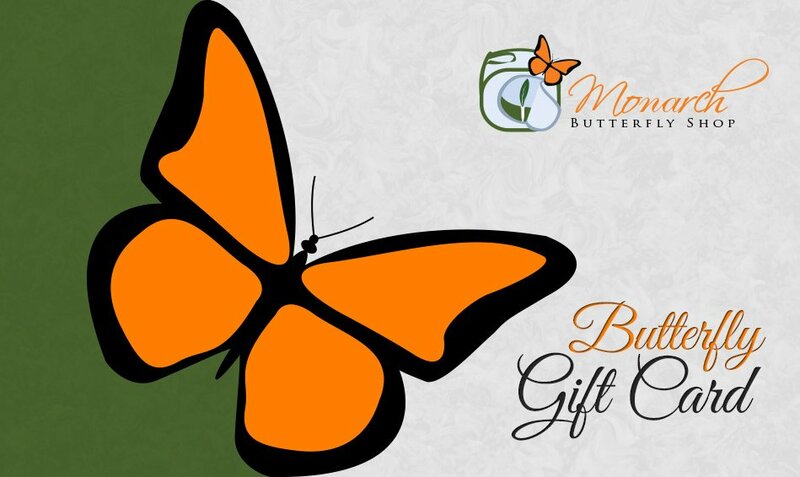 I would love to send a gift of the Butterfly crossing sign to the Beaver Creek nature reserve near Eau Claire WI as they have a beautiful Butterfly house and educate hundreds of people through the season, and raise, tag and release Monarchs. I love the Peace on Earth Tee Shirt because it is too hot here in Florida for Sweat Shirts. I love it because the creation process of the monarch could only be established by a divine creator who is celebrated with the Christmas tree. I love these little creatures and their creator.. I would love the butterfly puzzles. They look challenging and pretty enough to hang if so desired. I would especilaly like to preserve the Monarch puzzle. Hi Tony. It’s so hard to choose! I’d love to give my grandchildren the Munch a bunch of Milkweed book because they love learning and were really excited about my first adventure this year of raising our first Monarch this fall. The 3 butterfly pin would make a wonderful gift for some of my pollinator loving friends, and the butterfly crossing sign would look great in one of my gardens! I would like to receive the butterfly crossing sign as a gift. The sign would be posted at the entrance to my ‘work in progress’ butterfly garden. I love the butterfly crossing sign. My neighbors definitely know what I’m doing but I have problems with the lawn guys who want to spray everything in sight. Maybe this sign will wake them up! I think the brooches are gorgeous! Giving one to a friend who is reluctant to start a butterfly garden just might get her going! Or, I could actually keep it for myself and make her jealous enough to get moving. It’s too easy to attract butterflies, especially the monarchs with the large variety of milkweeds. Of the first six butterfly gift ideas, I would love to have the stamps for my mom and aunt; who still love to write letters to each other. Otherwise the book would be a lovely thing to donate to my teacher friend’s classroom. I like the 500 piece butterfly puzzle. Winters are long here in Minnesota and it’s nice to sit by the fire and work on a puzzle during the long nights and plan my next years butterfly raising. I bought myself the Christmas monarch t-shirt, and it is due to arrive today!!! YAY! I like to wear monarch clothes because it is a great way to start a conversation with others who may not know about all the people helping the monarchs. Some people think it’s something for children, and once we start talking and my enthusiasm bubbles over, they learn that raising and releasing monarchs is for EVERYONE! Wow. The selfish me would love the Butterfly Sign for our recently developed butterfly garden outside of my science lab at school. There is a small corner the students continue to run through. Florida is unusually warm still. But the Monarch Buddies book would be perfect gift for our 2nd grade students who study the life cycle. All of the gifts choices are super. They are all great choices. I think I would choose the butterfly puzzle, because it would be something I could do with my daughter who helped me raise 4 monarchs this summer. Out of the first six gifts, I would most appreciate receiving the butterfly crossing sign to place in my Monarch Waystation number 16948. Great gift ideas….for any continent. Love the crossing signs and children’s book. Any of those is a winner for me. I love all of these but my favorite is the butterfly crossing sign. It would look so cute in my yard!!! Hi Tony! What a great idea to promote Monarch butterfly fall migration! I would love to receive and wear the “raise the migration” shirt. and I would wear it every where to help spread the word about the importance of keeping the monarch population from declining. I had a super time this last summer raising 8 healthy monarchs and sharing what I do with friends and neighbors, and finding other people in the area, Minnetonka, MN, that are of like mind! Our Grand kids, 9.5 and 8 years old are excited to see the stages of the monarchs when they visit us from Madison Wisc. I feel like a monarch ambassador. Love my new summertime hobby as a retired teacher!! Boy, this was a tough one! So many great gifts. I love them all! I think I would choose the Monarch Buddies Munch-A-Bunch of Milkweed book and donate it to my granddaughter’s classroom. It’s never too early to educate the next generation of nature enthusiasts, protectors and fans of all things butterfly!! I Love the Monarch Buddies book idea!! I would love to receive the Butterfly Crossing sign. I often stand in awe in our backyard, watching our Monarchs who grew up in Monarch Butterfly Garden cages along with their Gulf Fritillary, Cabbage, Cloudless Sulphur, and Western Tiger Swallowtail friends, along with other visitors passing through. The sign would be a good signal for those visitors, along with the neighbors sneaking a peak. For me, the best butterfly-related holiday gift (which I would give to any or ALL of the children to whom I donated, this summer, a Monarch chrysalis, so they could witness the emergence of a beautiful butterfly) would be the Monarch Buddies Munch-a-Bunch of Milkweed book. This way, the children could read about the stages of development of the Monarch butterfly, from egg to chrysalis. 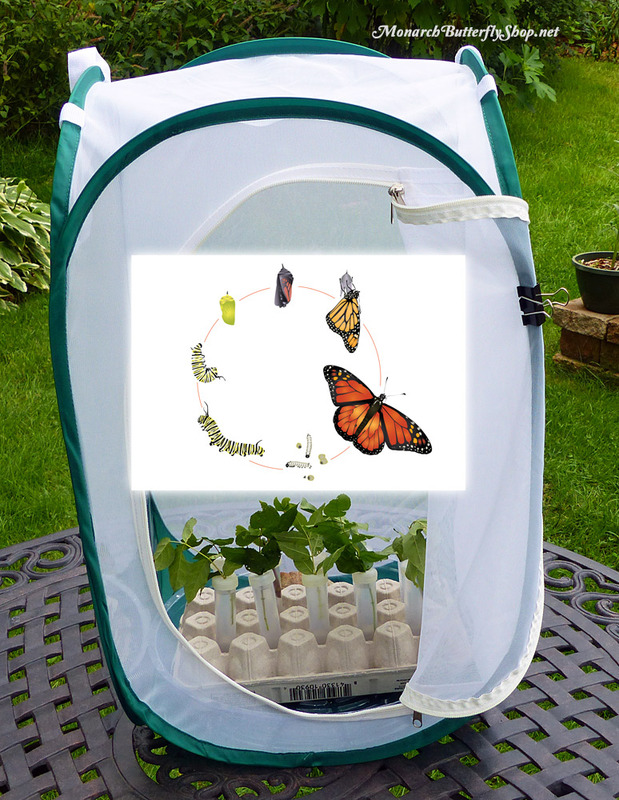 I am currently saving up to purchase a small butterfly mesh enclosure for ALL the children who expressed an interest in my rescuing, raising and releasing Monarchs projects this past summer. These are all really nice. I would like the butterfly puzzle. My mother has dementia and is very hard of hearing. She is still able to enjoy puzzles. I would give and receive the butterfly crossing sign!!! I actually did buy it for myself!! I would love to receive the butterfly crossing sign so I could proudly display it in my front yard to let everyone know we are a butterfly friendly yard. This was our first year of planting milkweed. My husband and I got such a kick out of finding the caterpillars and bringing them in and watching them grow into beautiful butterflies. I was such a proud “momma” when I released my “babies” back into nature and thrilled every day when they would return to my flowers to feed. I look forward to next season when I can continue helping monarchs and planting new plants to attract other species. I think the sign might also be a good conversation starter with friends and neighbors about butterfly friendly plants and the small changes they can make in their own yards to help the environment. I would most like to receive AND give the Butterfly Crossing Sign! I have a windmill in my front yard that the sign would look perfect on and it would let passersby know about the butterflies in our neighborhood ! (if I received it as a gift!) I would also like to give this sign to a dear friend who recently began a Monarch Waystation; she would love the sign as much as I do! I would like Lynn Rosenblatt’s book, I have her other book about Raising Monarchs and it is wonderful!!! (and signed by her) Her new book has some of my own photos in it. I know this book will be amazing too! I would love to give the puzzle to my niece, she and I love doing puzzles together. She also loves coming to our house to look for Monarch caterpillars in our butterfly and pollinator garden. My choice would be the “Monarch Buddies” munch a bunch. If we are to bring the population back to what it was years ago, we need to keep the younger ones informed on its importance in our world. I have a Great Grandson now and I hope to give him the knowledge to both understand and enjoy the part that all of nature plays in universal harmony. I would love to have the blue t shirt, it would be nice to wear when we have our Iris Society Meetings and Sales. It would provoke a lot of questions from the visitors too. I like the butterfly crossing sign as it would be helpful to show neighbors that the garden I created at the end of our street is planted for the butterflies. I also like the Monarch Buddies book and would give it to my daughter who is a teacher so that she may read it to her students. I always like getting kids involved in outdoor activities that have to do with nature. I would probably go with the pollinator stamps as the gift that I would get for me and others on my list. They seem to be the most practical of all the gifts and every envelope they are on will help spread the word about pollinators and the fact that they need us to survive. I would love to give the Monarch Buddies book to the local elementary school here in my town, this is a small school and I think this would be a great addition to educating kids on the Monarch. I would love to receive the butterfly sign and display it at the end of our driveway with the NABA sign. Earlier this year, The North American Butterfly Association Certified our property as a butterfly garden. We have 18 acres and have thousands of Common and Swamp milkweed on our property, that’s in addition to my personal flower garden where we have incorporated over 8 species of butterfly friendly flowering plants, that’s in addition to our Coneflower Garden. Of the first six Xmas gifts, I would like to receive the Monarch Buddies book. It is hot off the press. Would love to read it and then donate to one of our local library so that the children could enjoy reading afterwards. “ Monarch Buddies” book! She is a very special young lady ( and today is her birthday) who works as a special education pre-school teacher. She is devoted to her wonderful little ones and loves them as her own. I have introduced her to raising Monarchs. This book would encourage her to bring this wonderful, educational, and important practice not only to her classroom but to all the other classrooms in her school. I can envision it as a jump start to bringing eggs into the classroom and letting the children, first hand, experience the wonderful and exciting experience of adding to the monarch population! Thank you for all you do! Of the first 6 gifts, I had initially narrowed it down to two favorites…the Peace on Earth Christmas T and the Butterfly Crossing sign. Since I already have most of your T-shirts and plan to buy the Peace on Earth T-shirt anyway, I would prefer the Butterfly Crossing sign. How beautiful it will look on the post holding my Monarch Waystation sign!!! I love the colors and the constant reminder (mostly for my neighbors) not to use any insecticides near my home. I want to give the Butterfly Waterfall Puzzle to my mom who is in a nursing home. It would bring her such joy as she saw the beautiful picture come to life. Of all the gifts shown, I like the t-shirts the best. I would like them for myself, so when people commented on how nice it is I could educate them about the plight of the monarchs. And they would make great gifts for some of my butterfly-loving master gardener friends! I think the Monarch Buddies story for children is something I would love to receive and something I would love to give. I like to have children’s books at home for when my grandchildren or other cchildren are visiting. I love to read them myself and am excited to share this book with the children who first got me interested in the monarchs that were in our own Garden! It was a tough choice between the book or the forever stamps. I love that the stamps bring attention to our important pollinators but when it came down to it Is use the book more frequently. But forever stamps…. they’re great too!!! I would love to receive and would also be happy to give the long sleeved tee shirt, #1. I Love the transfer and it would be a lovely conversation starter! Just as much, I would love to receive and/or give the Life Cycle Puzzle. It’s a beauty! Thanks for all the wonderful information you share regularly, and I am excited to see what comes next.. Waiting for the cages to be back in stock, as that will be my first order! I would love to receive #2 the butterfly crossing sign asa gift! In that bright yellow it would look gorgeous by my passion fruit vine. Love it! These are wonderful items – so hard to choose. But I would love to give the Butterfly puzzles and I would love to receive the Butterfly Crossing sign. I also would like any of the remaining gifts. They are all fabulous gifts! To choose 1 it would be the butterfly puzzles! These would be awesome to do with our grandchildren in the cold winter months. We had so much fun raising the butterflies this year. I would like to receive the butterfly crossing sign. It would go in the area of my butterfly bushes and exhibit the importance they have. The butterfly crossing sign is beautiful. It would be a great addition to our butterfly garden near the Pismo Beach California Butterfly Grove. 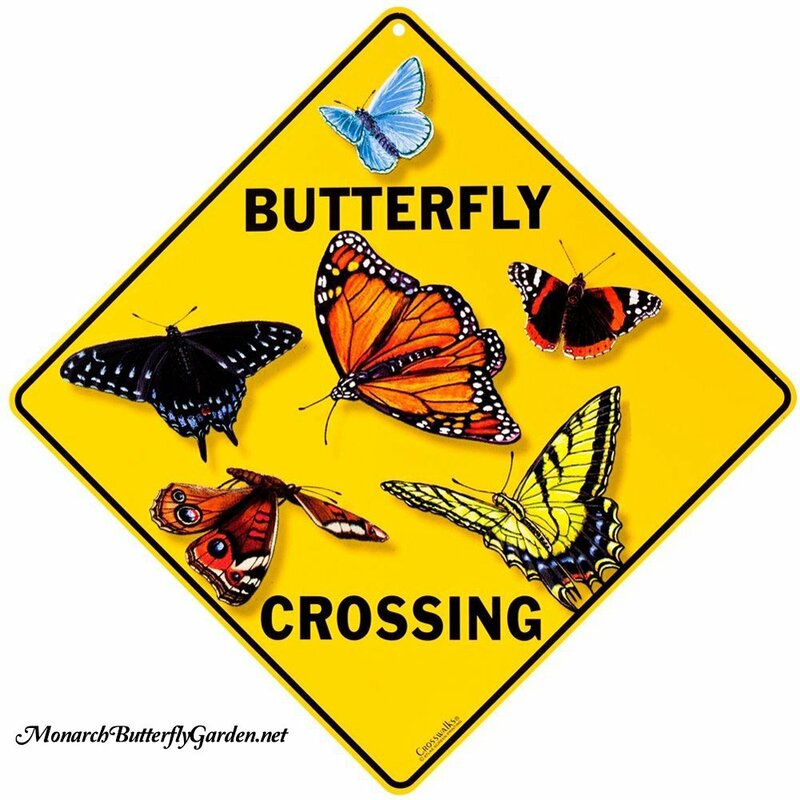 Butterfly Crossing Sign – I bought it for my garden fence the minute I read about it. I also used the Pollinator Forever Stamps all season. Wow! All the gifts are lovely and I would be excited to give and/or receive any of them! But I have to pick one so I would pick the puzzle so in the middle of the cold winter I could have the butterflies still around! All of the gifts are great! I love the butterfly crossing sign! I purchased your small butterfly cube earlier this year and wanted to let you know it worked out great. I have been raising Monarchs for several years now. Last year I raised & released over 200 Monarchs. This year I raised & released 126. All of my caterpillars were gathered from eggs entirely from my yard. I went on daily egghunts. Many of my friends were so impressed with my cage setup, that they too have gotten the fever and started raising also. I am a proud monarch mama! I would like to receive the Butterfly Crossing Sign. I also think it would be a great gift. I would place it in my front yard where I would hope that my neighbors would see it, become interested in my butterfly raising hobby and plant butterfly friendly plants in their yards. I would love to receive and give out the Butterfly forever stamps. This way I can raise awareness with every letter i send and bill I pay! I would love to give the monarch coloring books as a gift. We need to educate the next generation of monarch guardians how important these creatures are to our environment and our world. My 5yo daughter is my lil helper when I am caring for all the catapillars we raise and she absolutely loves releasing them with me. It gives me a great opportunity to pass my knowledge down in hopes when she is older, she too will be an advocate for our pollinators. All of these gift ideas are great but I would love to receive and give either of the butterfly broaches. I love the idea of being able to adorn any outfit or coat with something I love so much. Butterflies!!! I would love to give two of the butterfly brooches (plus one for myself) to my two good friends at work. They have listened to my stories of monarch raising and have a whole new understanding and interest. They say they always think of me when they see butterflies and bring me questions, too. I’m retiring at the end of the year and I’d love to give a couple of “farewell” tokens like these to keep the monarchs in mind when I’m not around! And I know they’d really like them – they’re very pretty. I would love to have the lovely butterfly stamps. It would make bill paying so much happier to see a pretty butterfly on the envelope. The Monarch Butterfly Book for Kids would be my choice of gifts. I would like to give this to my grandchildren so they and their parents can learn the problem that Butterflies have as to being almost extinct, how we can all work together to prevent this and to learn how the metamorphosis of the butterfly is the symbol of life. Milkweed does not take up a ton of pace in your yard and everyone could do this. Teaching on the level of a child is how adults learn too! I think a Milkweed plant might be given to all my grandchildren, even the older ones this Christmas! I would love the Forever Stamp Stocking Stuffer because I send photo cards of all the beautiful butterflies that come through my south Florida garden to family and friends and the stamps would be like icing on the cake. Thanks Tony! Your blog is very informational. I also love them all. I would especially love to wear #1 the sweatshirt or the tee shirt. I work in the local schools and this would get lots of views! Of gifts 1-6, I would most like to GIVE the Monarch Book for kids. I want to give it to my grandson and start teaching him about the Monarchs. Hopefully this summer he will be able to watch the amazing process of the Monarchs in our backyard! As far as the gift I would most like to RECEIVE, it would be the Monarch (and pollinators) postage stamps. They are lovely and also promote the value of our insect pollinators. I would choose the puzzle because it would be great to do with children and I already have the stamps, which I love. The butterfly crossing sign would be prefect for me to receive as everyone in my community knows that I raise Monarchs and they tell me if they see a cat or where there is more milkweed. I’d choose the “Monarch Buddies Munch a Bunch of Milkweed” for my preschoolers. We raise monarchs each year and this is one book I don’t have. They love monarchs!!! I have put a butterfly garden in the land inside the culdesac of my street. I would love the butterfly crossing sign to hang on the back side with the hopes of keeping the cars that drive over the curb and ruin the plants from doing so. I love the Protect Pollinators Stamps. Very practical to mail Christmas or other holiday cards–increases public awareness and adds a little stability to the USPS…who wouldn’t love to get snail mail especially with a pretty stamp! I would love the ‘Peace on Earth’ sweatshirt. I’m a jeans and sweatshirt sort of person, and most of my sweatshirts have a ‘message’ that is important for me to convey. This would give me an opportunity to spread the word and educate. I love the forever Stamps…. a great idea for anyone… and will get some for me too. I also love the children’s book about the life cycle.. we need to get children interested in nature and science. They are the future generation and they need to learn about our environment and our impact on it. I think I would love to get the puzzles. Puzzles are always fun and give ya something to do when the weather might be lousy or or if you might be feeling under the weather. I love several, but my favorite is the pollinator stamps. They are beautiful. They spread beauty, joy and awareness. I feel this is a very useful gift that would be used and appreciated. I love to write thank you notes and my children do as well, so this is a great gift. Thank you! I really like the signs and especially the stamps. I already got the shirt, very pretty. WOW! They are all great gifts. I love the butterfly stamps; what an ecologically sound way of spreading the interest in butterflies. I also love the book, Monarch Buddies. I’ve been retired for several years (and I do raise some Monarchs), but I used to read Gotta Go to the children, the only book I found for little imparting information about butterfly migration in a way they could understand. Monarch Buddies would be a great follow-up. The sweatshirts are really pretty too! OH I just can’t decide!! My husband is making my, now our, garden landscape dream a reality. I do all the research while he is mostly labor. We enjoy doing puzzles together and the Ravensburger Butterflies is the size and style we enjoy. We get so many complements from people walking or driving by. I would give him the Butterfly crossing sign as a thank you for “Making Dreams Come True”. We have 3 short columns and one would be perfact to post it on. Our grandchildren, 2 -7 years old, all love books so the monarch book would be a great addition to my butterfly library so all 5 kids (more coming soon) can read it. They are learning to identify butterflies that come to our yard. It would also be a great gift to their teachers. This is the final year of installing our butterfly/pollinator garden in the front yard. This is our third productive year so we are able to say we have suceeded in my goals to a degee. My husband, myself and the two oldest granddaughters are citing butterflies we have not seen in our yard. We also have regulars. I stopped counting at 75 painted lady butterflies one day during their migration. Saddly, Monarchs have become very rare in our town. We used to see monarchs regularly in our yard but I have not seen one in many years. My husband knows my goal is to bring monarchs back around by providing them a butterfly bed and breakfast. I am following the rule of “if you build it they will come”. He is now wanting to now take that one step further by removing that chance element and begin raising monarchs. Our goal is now finish the backyard butterfly garden and hostile while simultaneously raising monarchs. I greatly appreciate all the work you’ve done to make it easy for us to pursue this lifestyle. I would very much like to receive the Butterfly Crossing sign. This year we raised 113 monarchs from eggs and cats we found in our monarch milkweed patches. 🦋🐛🦋🐛🦋 The sign would be a beautiful addition to our gardens! Best ever butterfly gift would have to be the children’s butterfly life cycle book. I have been raising monarchs for 2 years with help from my grandchildren. We need to teach our young ones about Monarchs so they can help keep them from extinction. We would love to have the Butterfly Crossing sign to identify our beautiful and productive butterfly garden here at the Ukiah Library. Not only is the garden a haven for the Monarchs and other species of butterflies and pollinators. The garden also allows us to grow seeds for pollinators to add to our Seed Library! Patrons love our annual Monarch display where they can witness the entire life cycle of of these magical creatures. The Monarchs are truly Social Butterflies Ambassadors that bring awareness to their current dire situation and to our seed library. Best ever list if butterfly gifts. I love them all. I choose the pollinator stamps because they Would be useful for anyone. They are a reminder of the importance and necessity of protecting our pollinators. I plan to buy a sheet to put on each Christmas package I wrap. Beautiful too. “Monarch Buddies Munch a Bunch of Milk Weed” is the gift I would like to give my grandchildren. Some of them helped feed the Monarch caterpillars for the first time this year. They observed the creation of chrysalises, and they watched the eclose process avidly. Some are too young to understand all that they saw and will benefit from its clear teaching. The book also will be a great how-to-help-the-Monarchs introduction for the grandchildren who didn’t share this beautiful, God-given experience. Hello…my favourite giving and receiving gift is the butterfly crossing sign. Second place is the butterfly flag. I liked these ideas so much that I purchase two of the butterfly crossing signs for Christmas gifts-one for my mother and one for me! I also bought s flag as a gift and Will be giving that to myself as well (from santa of course!). The reason I liked these is they are great additions to my front and backyard….. The gift I would most like to receive of the first six items is the “Monarch Buddies” book because it would be useful to use while I’m volunteering as a docent at Monarch Garden in Gilroy Gardens. Hi Tony , Personally I like the sweatshirts a lot. It will remind people in the winter time not to forget about the mission of saving monarchs all year long. Maybe some people are only aware of them when it comes spring. I also like the children’s book and if I won it I think I would very much like to give it to a young person to get the next generation involved in helping the planet. We need the next generation to care for our earth. So hard to choose! I would have to go with the Monarch butterfly book for my nieces so they could learn more about the life cycle and hopefully get their interest up in helping protect and raise them. I think my sis-in-law would love the butterfly sign, we like a lot of the same things and I love it, too! As another comment mentioned it would also be a great reminder to my neighbors to never spray anything that could harm them. 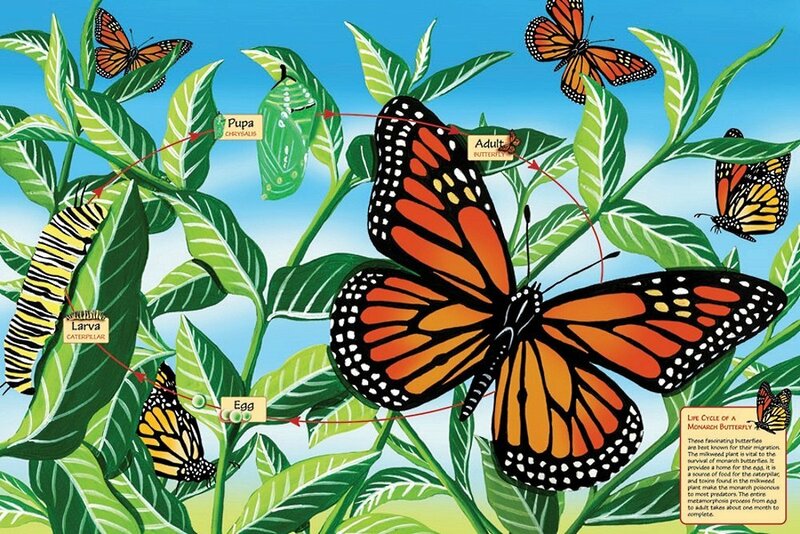 I would love to give the Monarch Life Cycle Puzzle (48 piece) to my granddaughters. We like to do puzzles together and they have been learning about Monarchs both with me and in school. It is never to early to pass on a great passion! And as a footnote, I personally wouldn’t mind receiving one of those beautiful tri-color brooches! I would love to have the Butterfly crossing sign for the new Monarch garden that my great granddaughters and I are starting. Teaching a new generation totake care of the Monarchs! Great gifts! I would choose Monarch Buddies book as I love sharing my love of butterflies with children through local groups, schools, park meet ups, and friends and I would love to read this book to help the kids understand more! Wow! Spectacular choices! I would love them all! The “Butterfly Crossing” sign for our driveway because they do cross from the garden to the fields frequently. The “Monarch Buddies …” book will be perfect for any child and definitely for one of my grandsons, who loves all creatures and is ready to learn more. The puzzles will be great additions to our camp nature program (after I have enjoyed them over the winter!) The brooches are perfect gifts for friends! Really, everything so far is now on my wish list!! Thank you! I would give the children’s book to my 5 year old grandson. He was a big contributed to our raising our 6 monarchs we raised this summer. Tony, I don’t know that I can say just one, so I will write a monologue, LOL. I have the b-fly crossing signs on my Xmas list so I guess those a thumbs up. And I think the kids book is cute if you have someone to give it to. Brooches, I’m not sure how popular those are these days. Puzzles look interesting but need to find someone who does them or it is a wasted gift (I like them, but don’t have time/ not a priority). Now for the shirts…in general, you come up with some cute designs, but these days, I am all about 100% cotton. (did you know women are literally getting sick from wearing those yoga pants 24/7 from the chemicals absorbing into their skin?) The info isn’t enough about the material along with how the sizing would be, is there womens fits, mens, fit, unisex, etc.? Lastly the sweatshirt is really uninteresting…looks like a very cheap sweatshirt. I’d be much more interested in a heavy weight zip up hoodie that is all pre-shrunk cotton (but I also just paid $75 for a very heavy weight pre shrunk cotton zip up hoodie, LOL). Look at wwf’s site, they have some neat shirts and designs in healthy fabrics….may spark some ideas. I’d love to wear Monarch gear if I found the right stuff! I would love to give and receive the butterfly sign. Receive to accent my waystation, give to share with another the beauty and rewards of living with butterflies! I would love the puzzles. They would be fun to do during the winter while waiting for the return of the butterflies next spring. And I would give the garden sign to my friend that introduced me to raising monarchs. She has a beautiful garden! Our urban, certified wildlife, community educational garden for all; A Child’s Inspiration Wildlife Discovery Garden, would most like to receive the new Monarch Butterfly Book for children, “Monarch Buddies Children’s Butterfly Book.” We can’t wait to continue to share monarch and other native pollinator inspiration with butterfly and nature enthusiasts of all ages and abilities, using a butterfly book dedicated to preserving habitat. Love everything, but would get the book for children as I would hope my great grandchildren would get as excited about butterflies as I am. I would love to receive the butterfly crossing sign. My butterfly garden is in a separate area of my yard since it keeps growing and the sign would set it apart perfectly. Plus, it is soooo cute! I would love to give anything but the monarch life cycle puzzle would make a great gift for kids and adults both in my family. It would help to educate while being a fun activity. I would love to give my Children the Monarch Buddies book ao that they could share it with their friends so their friends woyld understand what a great ecpeeience that the stages are. I raised 80 Monarchs & some black Swallowtails this year at my waystation in Kansas. I like the butterfly crossing sign the best. I enjoy your website! I would love to give or get the Monarch Buddie Munch a Bunch of Milk Weed Book. Being a first grade teacher, I know the life cycles of a butterfly is taught in the first grade science curriculum. It would be a good gift for my grandson’s first grade teacher. Plus, it brings back memories of when my own children and I would go out looking for Monarch caterpillars together and watching them going through the different stages of their life cycle. Now I take my grandchildren Monarch egg and caterpillar hunting. I love the children’s Butterfly book. I would purchase that and give it to the little ones in my family. I enjoy bringing interest to children about the Monarch butterfly. To this day children I’ve have shared the Monarch life cycle with say they think of me and are aware of the need for conservation each time they see a Monarch This would be an excellent way to get them interested and involved. While I love all the gifts, the MONARCH BUDDIES Munch-A-Bunch of Milkweed book tugs at my heartstrings. I was a kindergarten teacher for many years. One of the children’s favorite activities was raising monarchs from caterpillars to butterflies. The children were enthralled as they watched “Monty” eat the milkweed plant, growing larger and larger. They were thrilled when they saw the beautiful chrysalis (some years we were able to actually watch the transformation; others years we were thrilled when we left the caterpillar in the afternoon and returned the next day to see the beautiful chrysalis that had formed overnight). The children were so excited when they watched the butterfly emerge from the chrysalis and unfold its wings (again, some years we we able to watch it hatch, other years we arrived in the classroom to see an empty chrysalis and a beautiful butterfly feeding on the flowers we had placed in the cage). The most thrilling part for the children was when they were able hold the butterfly on their (well-washed) fingers. I have so many fond memories of wide-eyed children watching the butterfly “taste” their fingers. We were always a little sad when we took Monty outside to release him, but we understood that we were doing our part to help the monarch population grow. I read many butterfly books to the children during this unit — the MONARCH BUDDIES Munch-A-Bunch of Milkweed book would have been an excellent addition to reinforce importance of milkweed in the monarch life cycle. I plan to buy several copies of this book and gift them to the kindergarten teachers in our district. Because the monarch’s future is in our — and the future generation’s — hands! I love the butterfly crossing sign. The shirts are also very pretty. I would love to receive the butterfly stamps! I have some already and they are beautiful! I would give the butterfly book and puzzles as gifts to my nieces and nephews. I’m trying to instill the love of butterflies and planting of milkweed at a young age. Well I already gave myself the gift of the butterfly crossing sign. Fell in love with it and it is really nice. Very happy with it. I will put it out by my blue mist flowers where the monarchs love to eat. As for the second thing I would most like is the butterfly puzzles. Unique and very pretty. A good thing to do on a winters day. You’ve Outdone Yourself. Its So Hard To DECIDE. I’d Wear Shirt Year Round. Absolutely Love The Butterfly Garden Sign And The Forever Stamps Are Genius. I’m Always Looking For Unusual But Informative Stamps At Christmas. Would Love To Give Or Recieve ANY Of Beautiful Gifts. Thank You. 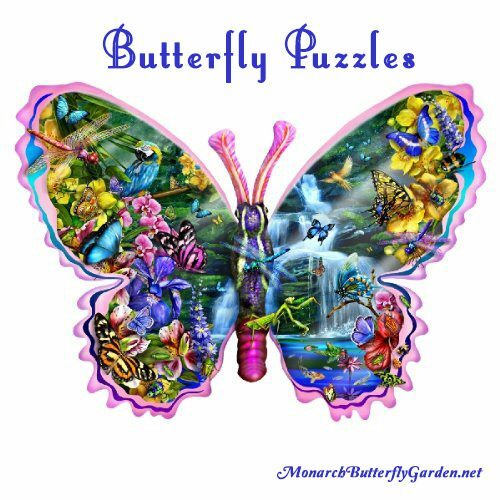 I’d love to receive the butterfly waterfall puzzle because it would help me get through the long cold winter here in PA. I love the shaped puzzles. I also love the garden sign. I appreciate all of the Gifts were Awesome and offered many Wonderful Options/Price Ranges for All Age Groups. I would like to have the monarch book and gift it to my wife who is a school teacher and teaches grade two. We raise lots of monarch butterflies every year and we get great enjoyment out of doing so. This last Summer we successfully raised 231 eggs and or caterpillars to become monarch butterflies. As we both enjoy this hobby, my would be thrilled to read and show the book to her class so they can learn all about monarchs. Each year my wife’s class gets to see a couple of caterpillars that are brought in live and go through the cycles of life before becoming a butterfly. I would like to receive the butterfly crossing sign so I could post it beside my waystation sign. I raise monarchs and this s good reminder to visitors to be aware of protecting our pollinators. It is also a way to bring up the conversation on preservation. Maybe the visitor might like to start raising them! My neighbors tell me they see “my” monarchs on their property. I like both the stamps and the life cycle puzzle. I love doing puzzles and this one is lovely, so it would be the first choice for me. The stamps would be a close second gift since they are also lovely as well as useful. #2, the Butterfly crossing is my favorite. I want it and I would like to give it to another for several reasons. In my urban neighborhood, the sign would spark conversation and education about butterflies and chemical free gardening. My next door neighbors are butterfly and bee enthusiasts too and we would like to continue to support gardening for beneficial insects and organic gardening. I would like my pre school to obtain the sign and post it prominently. I have started a butterfly garden for a real life science investigation but have been stymied by the school districts’ lawn care service who mowed down my milkweed in August and who uses chemicals on the weeds in the playground area. The school district continues to use chemicals to get rid of the weeds and I would like a ban of such around the butterfly garden. It’s another opportunity to educate my colleagues and administrators. I would love to give the butterfly crossing sign to my grandson for his room. The colors are so bright and beautiful! For myself, I would like to have one of the brooches. So hard to decide! I think I would go with the 500 piece butterflies all over puzzle. I love puzzles, especially Ravensburger ones. I do love the butterflies crossing sign though! I like the book for my grandchildren or myself. I looked at the preview on Amazon and it has wonderful pictures. I am not a fan of books about Monarchs with cute illustrations, so this is perfect! I prefer realism! The puzzle of the Monarch life cycle is different from two others that I own, so it is a good option as well. I would like to have the Butterfly crossing sign the best as a gift to me. I am totally reworking my flowerbed to turn it into a “butterfly crossing” and I would proudly post the sign to make sure everyone knows how important it is to include the necessary plants. Not to mention that the plants are beautiful and many of them are perennials that return year after year. As a gift for someone else, I like the Monarch Buddies book. It is the best chance for educating future generations of butterfly “savers”. It is great for school teachers to teach students and for families to teach their children, grandchildren, nieces and nephews about how to Up The Migration. Teaching others multiplies knowledge exponentially. I released my final Monarch yesterday, November 17, 2017. The temperature was balmy and near 80 degrees. Out of 35 caterpillars that I found randomly in my flowerbed, 15 eclosed looking healthy. Unfortunately one died while morphing and 19 had to be euthanized due to tachinid flies. That raises my annual total to 75. 60 from eggs and 15 random fat cats. I would like the Monarch for Kids book to share with my grand kids. We already have the life cycle puzzle and postage stamps. The kids were very interested in the monarchs that grandma was raising last summer. The butterfly gift I would most like to receive is the Butterfly Crossing sign because I want to educate and encourage others to have gardens including nectar plants and milkweed in order to help the Monarchs and to enjoy and love the butterflies as much as I do . NEW Monarch Butterfly Book for Kids, Monarch Buddies Munch-a-Bunch of Milkweed. This would be a great resource for our Youth Garden Demonstration Butterfly Garden. Thank you for your the newsletter. I enjoy receiving the information. I would choose the Butterfly Crossing sign and put it in my flower bed at our public library in Bartlesville, Ok. I am a Master Gardener and we do the flower beds at our library. Love all the other Christmas Gift ideas. Comment Contest: The Pollinators Forever Stamps are what I would gift myself or buy for gift giving. The reason I’d choose these is because one can use them all year round and one sheet gifts 20 family and friends a mini photo of Monarchs and bees. What a better way to spread the love? It would provide a topic for conversation and awareness. I would like to receive AND give the Monarch Life Cycle 48 Piece Puzzle for Kids because it would become part of my butterfly action plan at the town Senior Center, where they raised butterflies with me this year, AND where they always have a puzzle going. Even though they aren’t kids — the lifecycle lesson is taught with nice big puzzle pieces, and not too many of them. Give and receive. I like the Butterfly Crossing Sign the best, because I want everyone to be reminded not to spray any pesticides near or around the garden, and also to bring attention to any garden guests, the beauty and awe of watching these gorgeous creatures flying around. I’d like the Forever Stamps for myself. They are useful, pretty to look at & more importantly, remind the recipients of the importance of protecting our pollinators! I would like the butterfly sign. Once I post it, I hope to bring in curious visitors who want to know more about Monarchs and other butterflies. I would then promote how to plant a butterfly garden to attract all and help raise Monarchs to increase the population. My favorite gift is “Monarch Buddies ” because the book will teach a whole new generation of kids how to appreciate Monsrch butterflies, and how to help preserve the species. I would LOVE to both give AND receive the “Monarch Crossing” sign to remind drivers that butterflies, bees, etc. aren’t just flattened mush on their windshield. They are an irreprlaceable part of our food chain. Without them we’re all dead. The sign is both beautiful and educational in a subtle way. I would also love to give the “Monarch & Buddies book to as many libraries as possible, and urge them to read the book during story hour. Start teaching children that we all share one little blue marble, there is no Planet B, and if the adults refuse to care for our world so the next generation can survive , then we need to start teaching children to respect all species at a younger age. Some adults refuse to believe in climate change, but kids know when recess is cancelled due to air pollution. They are the leaders of the future. Let’s start them down the right path early on. I would like the pollinator stamps the most. I work for the Post Office and actually bought quite a few when they came out and think they are some of the best stamps ever issued. I like the Brooches the best. You can wear them year round and they would be a great gift too. So true, is Day 3 – PROTECT POLLINATORS Forever Stamp Stocking Stuffers. You can’t have one without the other. What a beautiful combination that illustrates the beauty in both species. I think that the book for kids would be the perfect thing to give a local school that I am trying to train to help me when I have to many mouths to feed. 🙂 They did very good this past year but I know that the teacher would have like to have more materials for the kids. We had a great year for monarchs and a huge part of it was due to the cages – they are perfect for the kids and all of us that release. I would most like to receive a beautiful Peace On Earth t-shirt that way as I wear it EVERYWHERE, I will be able to answer people’s questions about my shirt and educate them about our Monarchs and the need to pay attention to their plight. Maybe others will explore the awesomeness of planting milkweed and raising Monarchs too. Butterflies All Over puzzle would be fun to do with my 7 yr. old granddaughter who is an expert butterfly lover! She released over 200 monarchs this past season! I love the puzzle and book for kids! I teach 5th grade in Illinois, and we recently created a butterfly garden on school grounds. We love continued research and projects that extend our learning about Monarch Butterflies. I’m commenting to be entered into the contest. Of the first 6 gifts, I would like to give the book Monarch Buddies as a gift to a young person. The reason why is to help them become interested and educated on the monarch butterflies. The puzzle would be great for indoor recess at school. I think from what I have just seen the Butterfly brooches are the best gift, they are all very beautiful. I recently had a conversation with a friend about Butterflies and how his wife every year incubates caterpillars and creates butterflies. I have always loved butterflies but have never known this was possible. I would like to learn about the process, and learn as much as I can so I can do this myself. I would love to receive the 1000 piece butterfly puzzle as a gift. I would work on it during the Winter months while also dreaming of live butterflies visiting my garden in the other three seasons of the year. The pollinator stamps do make great stocking suffers because they are useful as well as gorgeous to look at. Now I just have to figure out which of my fellow gardeners would get them! I think I like the butterfly crossing sign best. Good looking and would maybe help inspire others that see to help out the cause! The sweatshirt/ hoodie is well designed and comfortable. I use the sweatshirts to remind my students of the importance of advocacy. I chose this sweatshirt/ hoodie in green – they associate milkweed with it immediately! They also relate to the peacefulness of Monarchs and are inspired to continue to help create more waystations . Hi I’m new to this all and love them all. Love the T-shirts that I can wear all the time, have 6 grandchildren and were on monarch watch with our three chrysalis….in an open air bird feeder for protection, so the puzzle and book is a great gift also. Can’t wait to see all gifts, as I’m already overwhelmed. For a gift idea #5, the puzzle because I would give it to my sister who loves not only butterflies but also puzzles so nice gift for her. As for myself I would love the brooches because you can wear them anytime but also can be good way to bring up discussions with others on ways to help our butterfly population grow. The gifts presented look wonderful. For receiving, I would love to receive the sweatshirt. It’s beautiful, and I love sweatshirts! For giving, I would choose the stamps, so that each time one is used, hopefully that person will think of not only my butterfly garden, but also butterflies in general. I would like to give the children’s book on Monarch butterflies because I would like to introduce the Monarch butterfly to children at a very young age so that they, too, can grow in appreciation and love for these magnificent creatures. I would like to receive the Forever Monarch butterfly stamps, because many more people will see them than just about any other gift. I love to send cards and letters through the mail, and this way I can share the joy of Monarch butterflies with many more people than just myself. These gifts are all great ideas. Of course I could always use the cage but I would love the t-shirt or the butterfly crossing sign. I raised 225 monarchs from eggs and several more from cats found late outside. I had a neighbor who lives over 1/2 mile down the road comment that she had never had so many monarchs in her garden until this year. She asked if they came from me? Probably, lol. Great contest idea Tony!! I Best like the Butterfly book. I could share this with my Great Grandchildren. I would like to help them to someday know the thrill and satisfaction of seeing a butterfly, that they have raised, emerge and begin life and know that they had helped. Good Morning! I live in So. California and am a newbie to the Monarch Butterfly community. Thanks for welcoming me with open arms. I love wearing bracelets. How about a butterfly bracelet as a gift? Thank you! These are all great! I would most like to receive the butterfly crossing sign as my daughter raises monarchs and it would be a perfect addition to her room. She’s the reason I started following your posts and browsing the shop – I’m hoping to find some great Christmas gifts for her that will further her love and rearing of monarchs. Hello, Is anything left from any previous Christmas? I still think of items I SHOULD HAVE purchased back then, and I think I missed them. “You snooze, you lose”. I snoozed, and I lost. I may have lost out on those, and, yet, still look forward to what you will present to us, next. Thanks for what you do!! Hi Carol, there shouldn’t be any supply issues with our raising supplies/shirts this year, but some of the other gift items will probably sell out again. So, if you like a gift idea, I would make a decision sooner rather than later. The shirts are all lovely. Hoping I will be able to get one. Wanted to update you on late season Monarchs. We started with 25 caterpillars of various sizes. We now have 13 and 2 chrysalises. It was a real learning experience and hopefully by spring we will be better prepared. We were unprepared for a brief cold snap and inexperience definitely took a toll. On a humorous note, we were able to bring a container with 2 plants into our carport what is enclosed by lattice. My 16 year old cat who is missing one eye and weighs 17#’s was able to climb 4 storage containers to use the planter for a bathroom. No caterpillars were harmed and I was amazed he performed that much physical activity. I would love to receive the crossing butterfly sign as a gift (I put it on my wishlist) for several reasons. 1- open curiosity in people who pass by at the same time asking them to drive slower. What a terrific list of choices! I’d love to receive the butterfly forever stamps! What a great way to spread the joy & beauty & need for butterflies! I’d love to give the Monarch Buddies book for my grandkids. They were with me during all the step with my cats this summer fascinated and engaged. The book would keep their interest alive during the cooler months along with the videos of the monarchs in Mexico! I would love to have the milkweed seeds! I grew some from seed & want to get it established in several places. I started a pollinator garden last spring & have learned so much from it.